January was a pretty laid back month here. 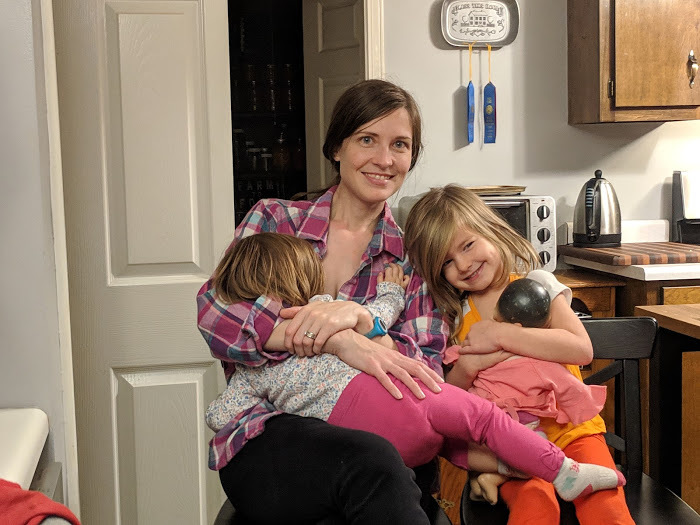 We enjoyed the long evenings gathered around the wood stove, slaughtered one of our pigs, set goals for our homestead and made plans to help us accomplish our goals in 2019. 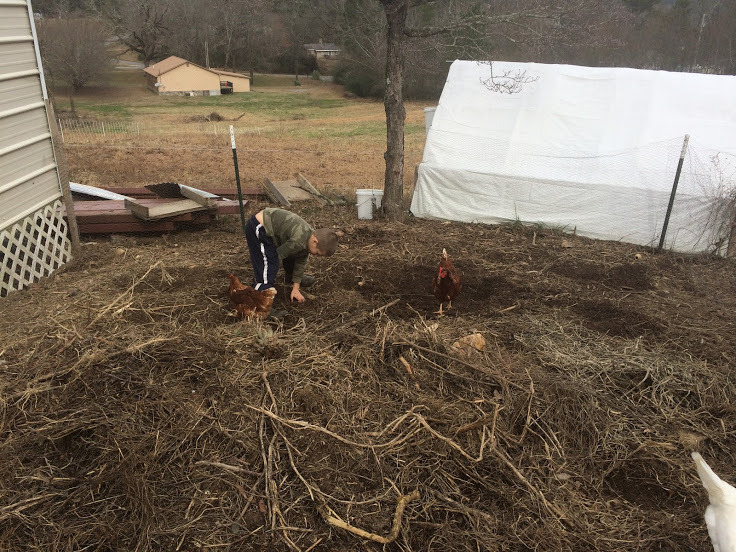 John David helped our neighbor build two chicken tractors in early January. 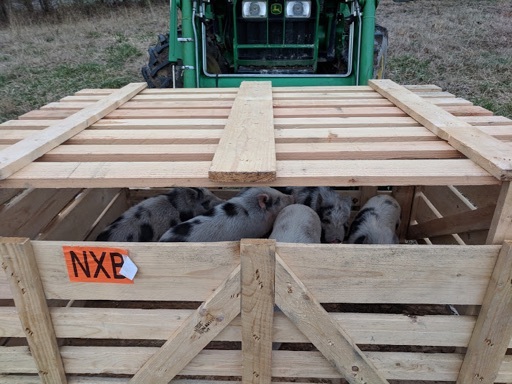 We moved the little piglets from their paddock at the front of the property to the barn with the yearling pigs. 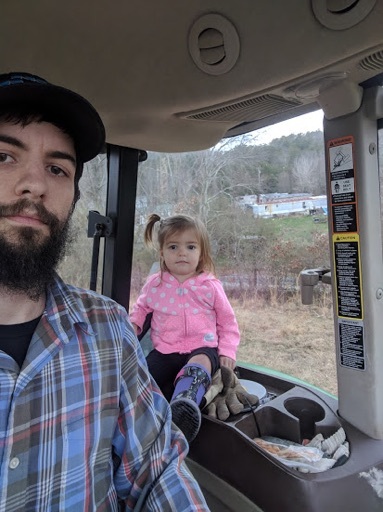 Laura helped daddy move the pigs – this girl loves riding in the tractor! 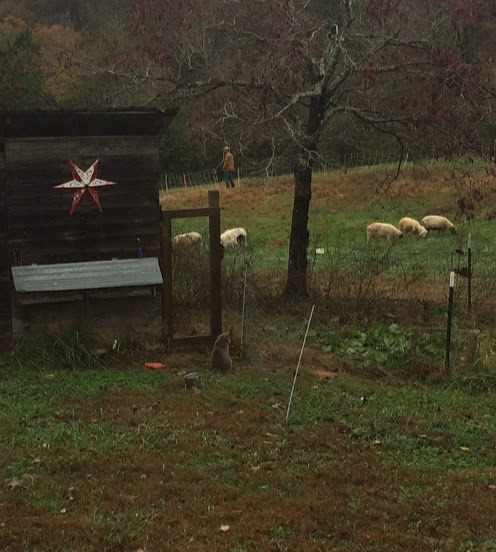 The sheep are all at the barn for the winter, enjoying their cozy quarters and hay. A delicious hot breakfast. 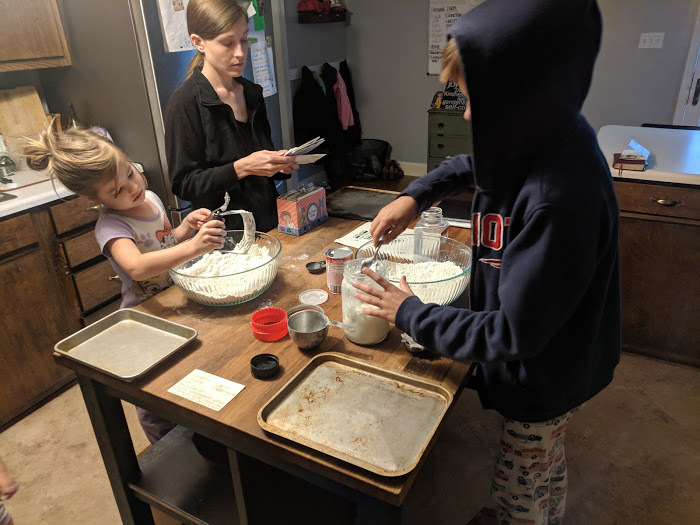 We love breakfast so much that we have breakfast for dinner at least once a week – it’s delicious and everybody in our family enjoys it. 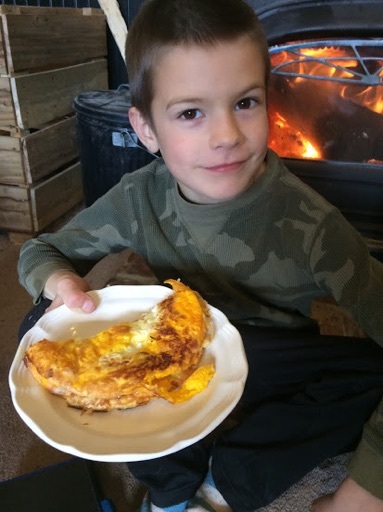 Weston was very proud of this omelet. 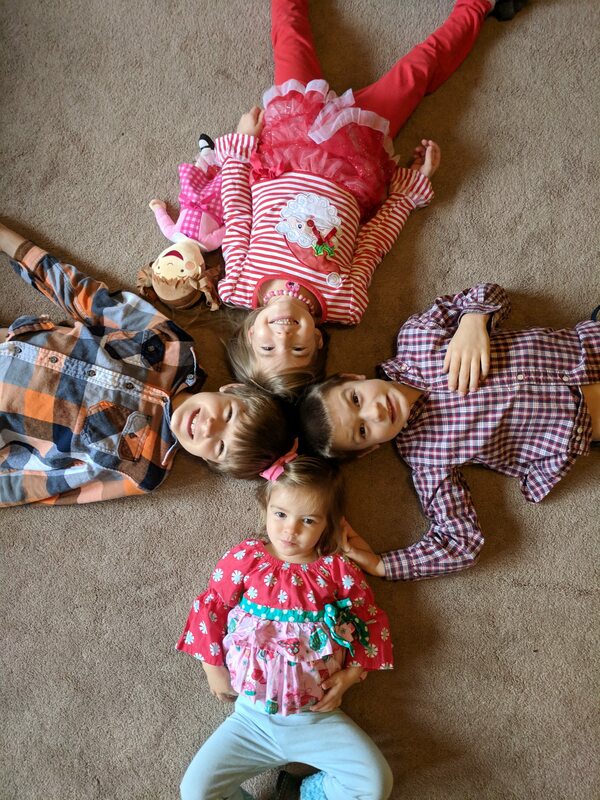 The 5 (yes, 5!) eggs were from his chickens and he made it all by himself. 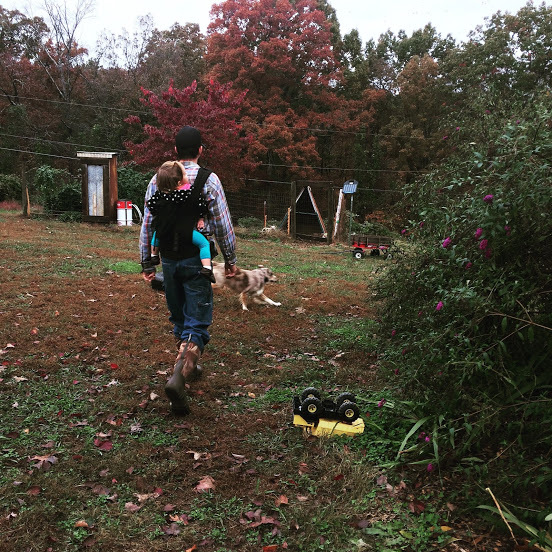 We’ve set a few goals for our homestead in 2019. 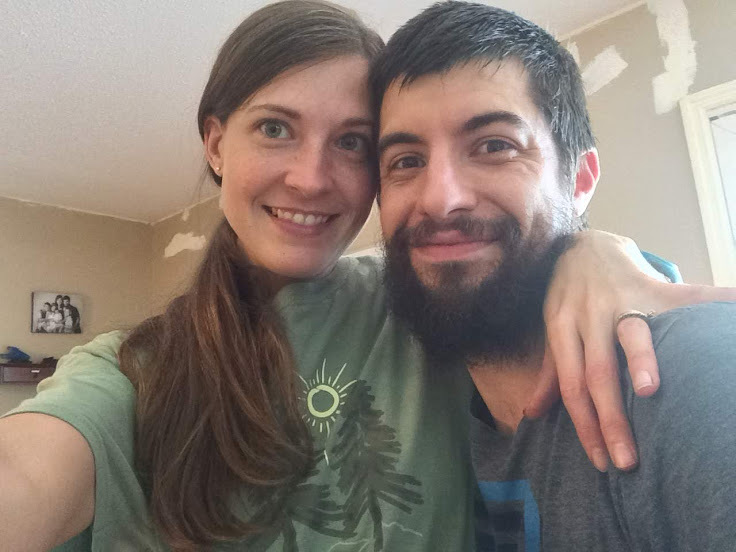 Most of them are fairly simple goals to help keep us on track as we go about tackling projects for the year and a few of them are lofty, exciting goals. *Our mortgage goal is a combination of a personal goal and a homestead goal because our mortgage is both for our home and our land. 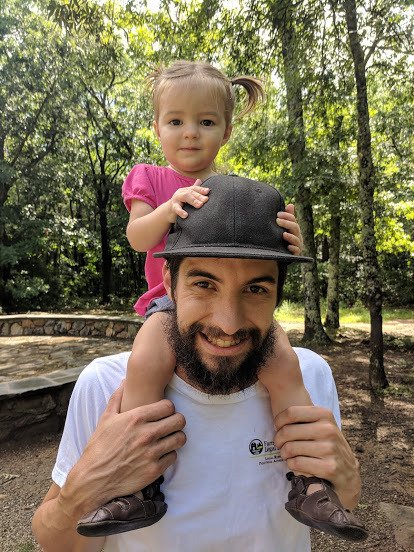 This $10,000 goal will (hopefully) be reached by a combination of our personal income, tax return, any extra money we may make from odd jobs/selling things as well as any profits we may make from the homestead. 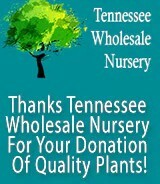 We would love to begin to make some money off our our agricultural endeavors to help pay down our mortgage. 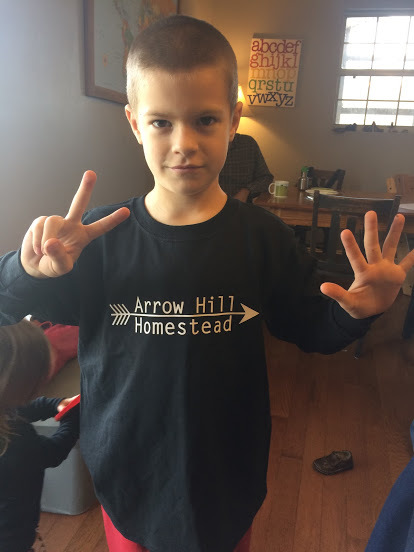 Our goals for 2019 have us excited about what the year holds and the learning and improvements that will happen here at Arrow Hill Homestead. 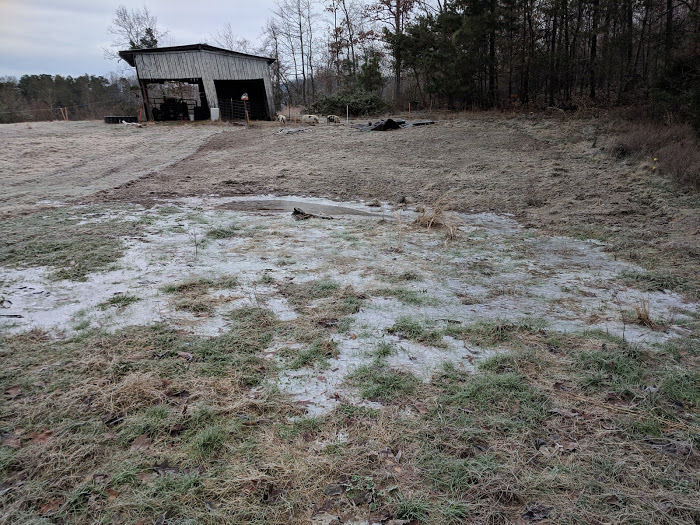 There really wasn’t much homesteading going on in the month of November – no garden work or special projects but there was quite a bit of hunting. 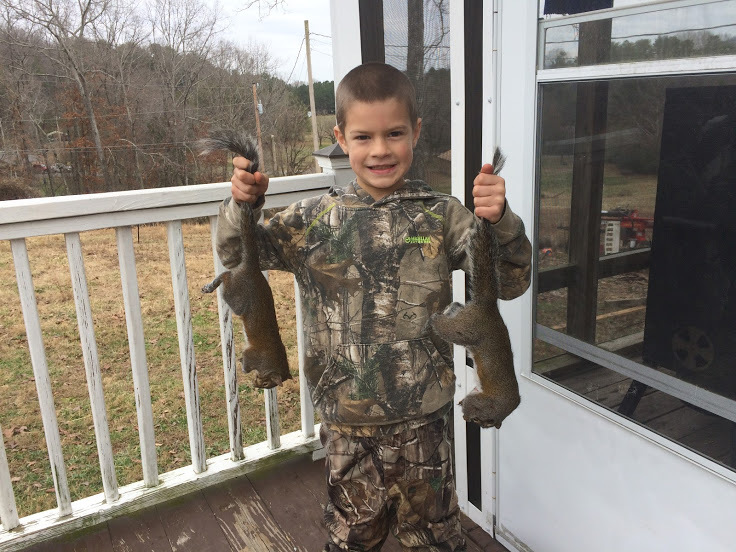 From hunting Papaw’s woods, with our neighbor at a hunt club and in West Tennessee with Papaw, the boys and their daddy logged quite a bit of time in the woods. This was early one morning before Weston and John David left to hunt in Papaw’s woods. He was excited but still sleepy. 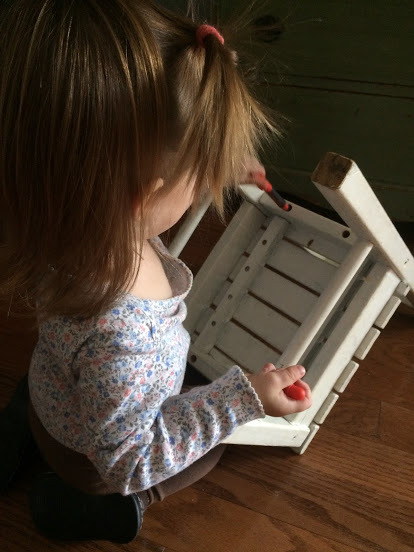 This little girl is into everything – climbing and so curious but she’s the cutest little bit! We’re enjoying our long evenings together in the living room. 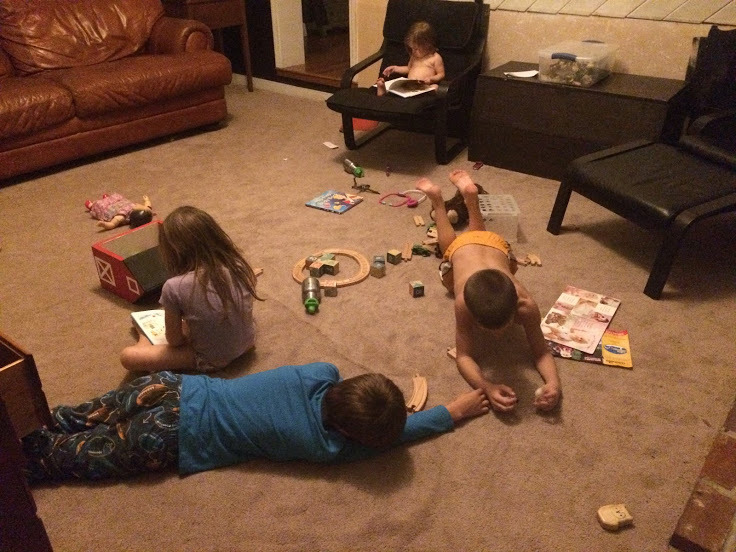 Playing with toys and reading books are so fun and cozy. 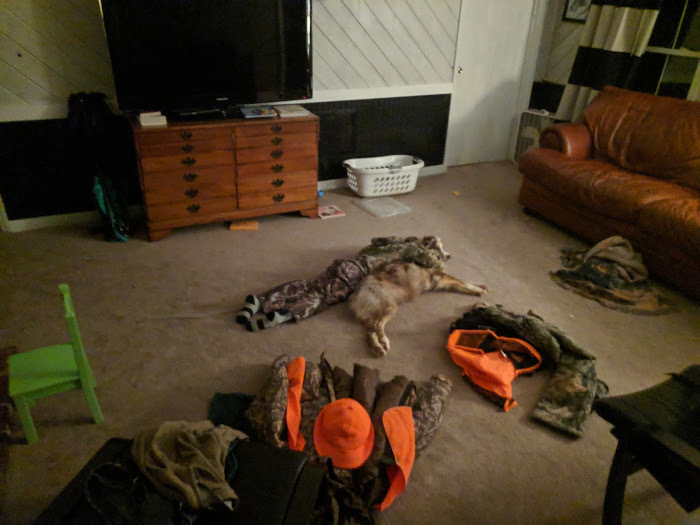 Our hunters were successful a few times so we had a couple days of venison processing. The saying ‘many hands make light work’ is true. It’s fun watching the kids learning and helping with such a practical task. Cecilia is our package labeler – she takes the job quite seriously. One of our favorite dinners is Breakfast for Dinner. The kids and their daddy love my biscuits. Add sausage, gravy, potatoes, apple and peach butter and we all have full and happy tummies. 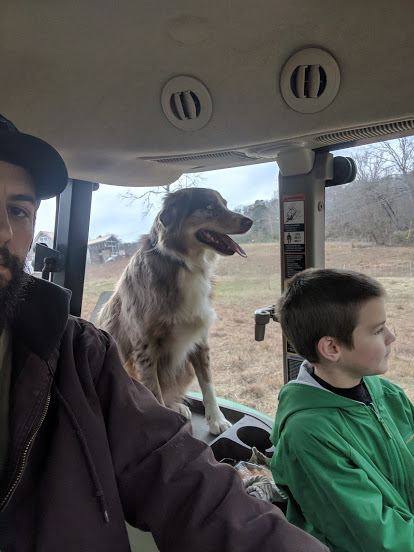 John David had a sweet little tag along for chores this morning. This gal loves being outside feeding! Cecilia is quite the little cook. 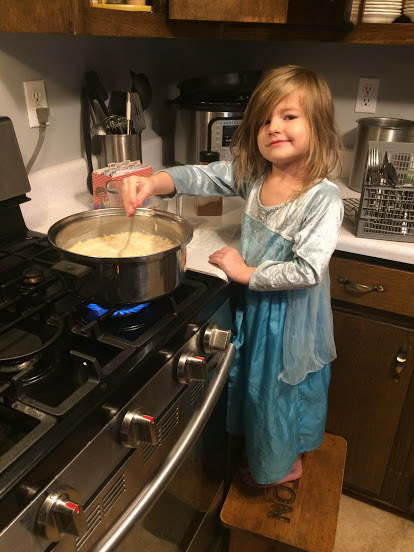 Here she is helping me make a pot of oatmeal for breakfast. Paxton and Weston were pretending to be sports analysts one evening at the bar so Cecilia and I were sitting in the middle of the kitchen watching them. 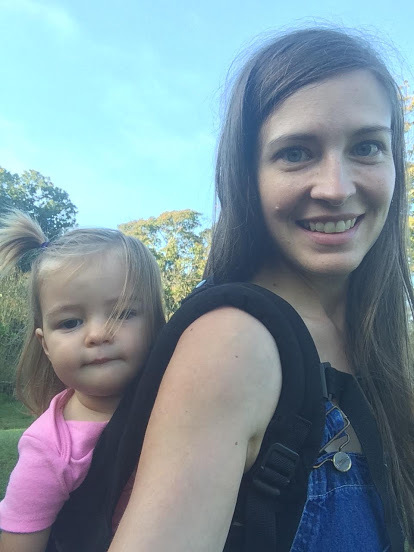 Laura was a bit fussy so I started to nurse her so Cecilia joined in and nursed her baby too – such a sweet little mama! I love moments like this. The view from our bathroom window just doesn’t get old. Especially when I have the privilege of watching my sweet man in his element doing what he loves. All three of our big kids know how to cook eggs. This morning, Paxton made my breakfast. 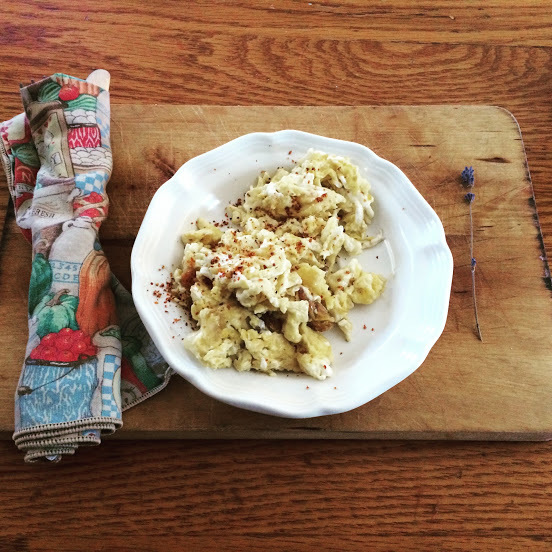 Not only did he make yummy eggs, he also plated them so nicely, silverware wrapped in my napkin and a sprig of lavender on the side – I love his attention to details. 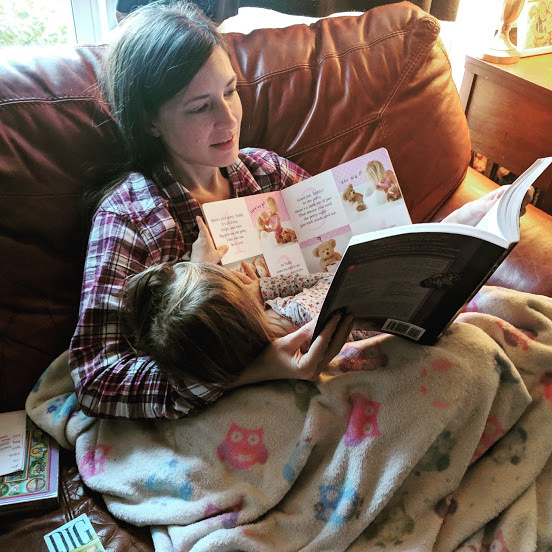 Laura has been obsessed with books lately which I love because I love books and we read a ton of books in our family. She’s too sweet. October found us on the go most weekday evenings with football. Between practices and games, there was little time in the evenings for anything but football. 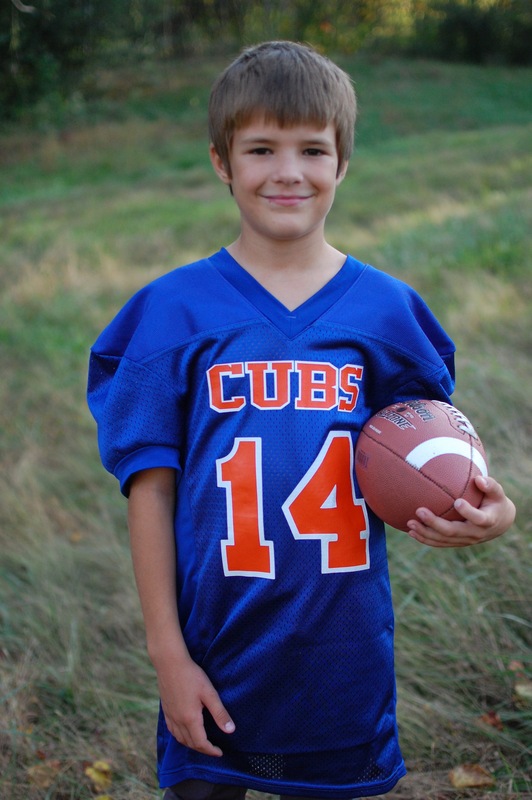 The boys enjoy football and while my introvert self who loves to be home in the evenings, I can manage a busy football season because I know it just a few weeks in the grand scheme of things. It was such fun watching them play on the same team and watch them on the sidelines find each other and congratulate and celebrate! 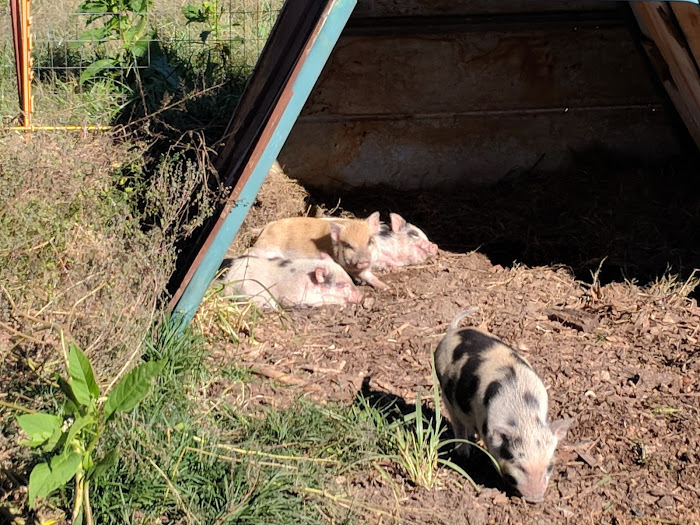 Baby pigs enjoying the sunshine. We decided last minute to enter a few things into the fair. 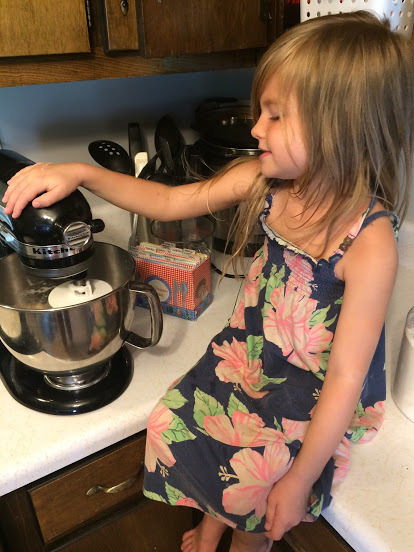 Cecilia and Paxton baked biscuits – I oversaw the process and helped Cecilia with measuring but they did all of the mixing and cutting their biscuits on their own. Cecilia also baked Chocolate Cookies. 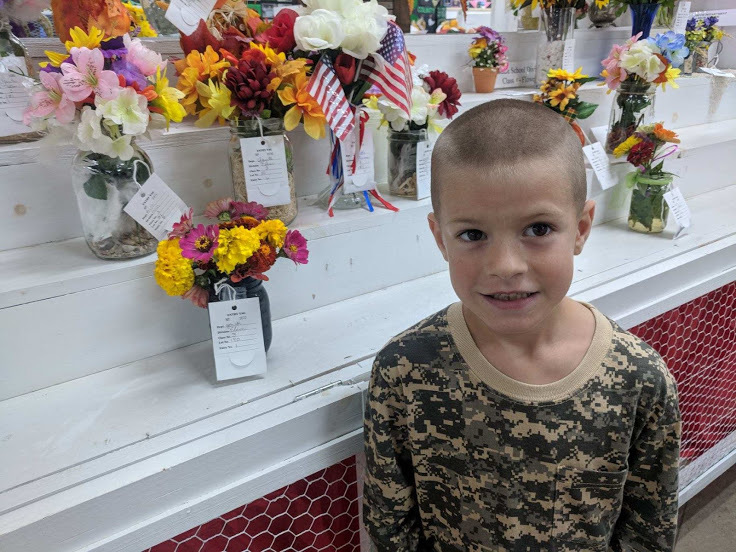 While we were baking biscuits early in the morning to enter, Weston was outside in the garden cutting flowers to make a flower arrangement. 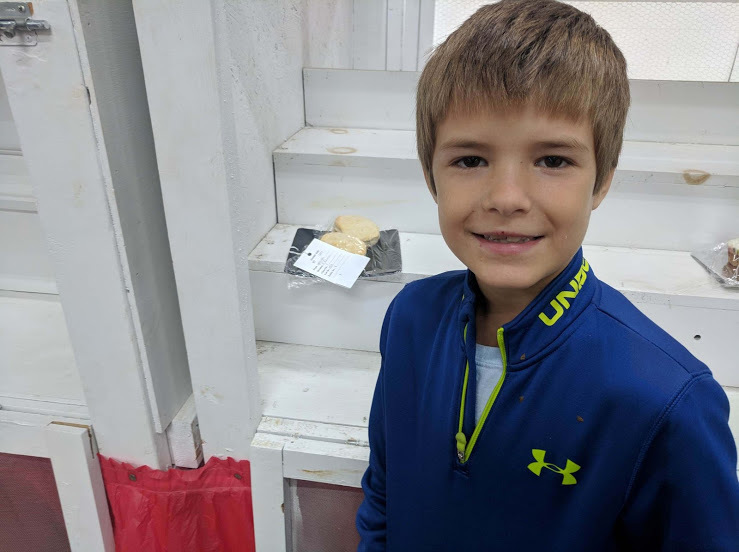 Paxton with his biscuits in their display case at drop off. Cecilia with her yummy cookies and biscuits. Weston’s lovely flower arrangement. 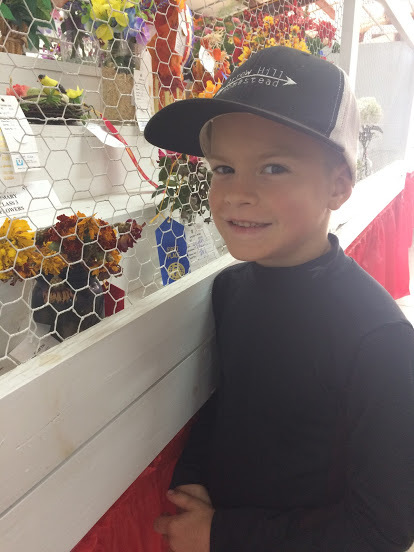 He did all of this by himself and I was so proud of his arrangement – maybe he can add selling flower arrangements to his little farm business! The boys team won the championship for their 7/8 football league since they only had 1 loss this season. They also were invited to a bowl game against the 7/8 city league champions. 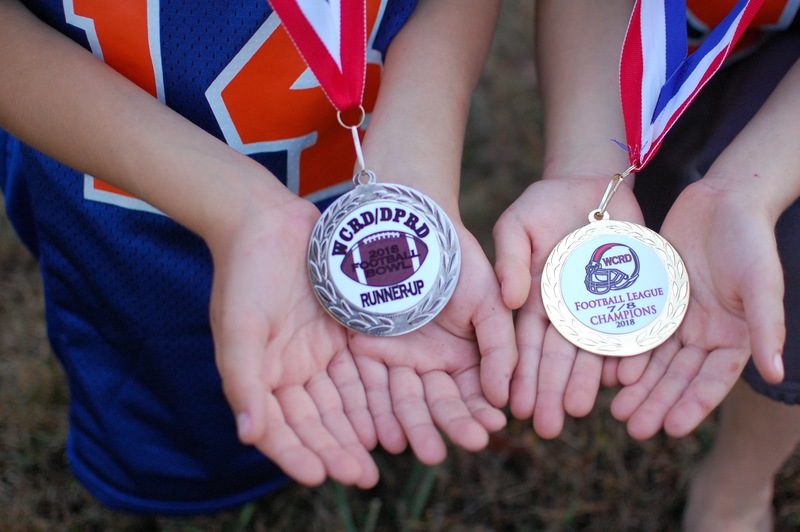 We lost the game and that was tough but they were proud of their medals. Weston enjoys old fashioned things just like his mama. 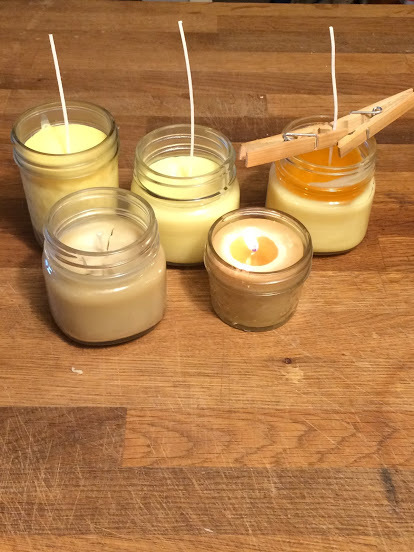 We ordered some wicks to use up some beeswax that I’ve had for a while and made beeswax candles. It was a fun process. It finally started cooling off around mid-October and we started burning fires in the evenings. We went to the fair one evening to see the results of their kids entries. Weston placed 2nd with his floral arrangement. 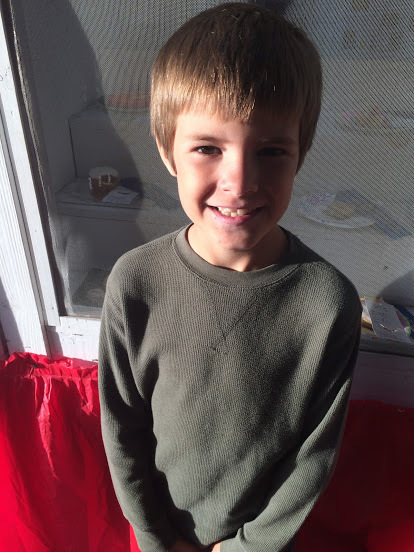 Paxton’s biscuits earned him a blue ribbon! 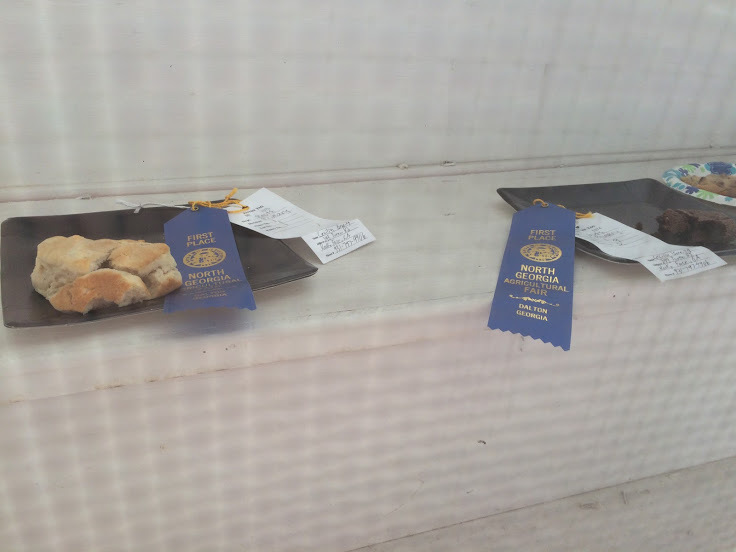 And, Cecilia’s biscuits and cookies both won blue ribbons. They were excited! 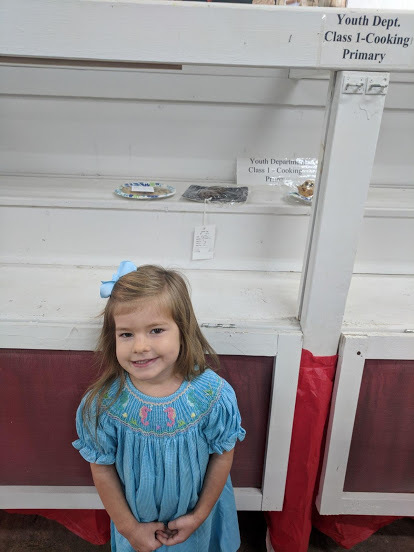 We enjoyed walking around the fair, looking at exhibits and animals and watching a couple shows. I love this picture John David snapped one morning. 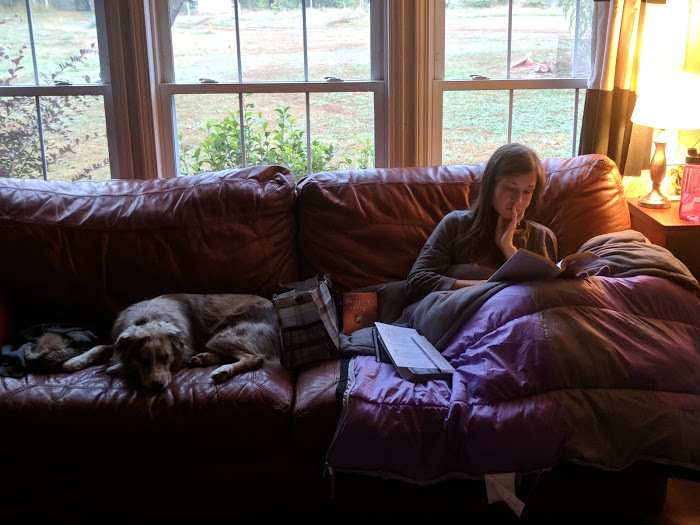 I try my best to get up early in the mornings before the kids awake to have a quiet start to my day with prayer, Bible reading and reading a parenting book. Copper often joins me. 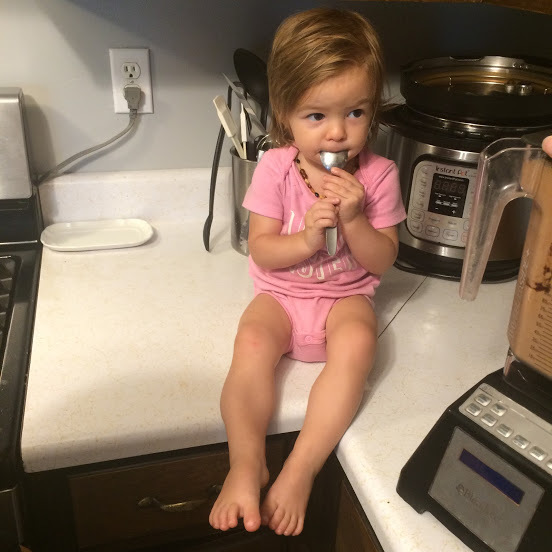 This one is too cute not to share – Laura is the best little eater. She apparently really loved dinner this night! 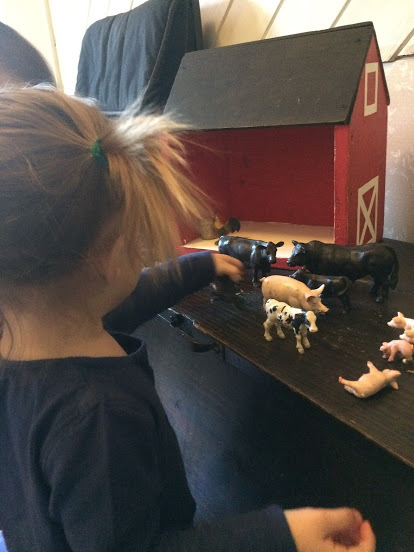 We brought Weston’s Schleich farm animals and barn downstairs and Laura enjoyed farming. This little barn was built by John David and painted by me as a 2nd birthday gift for Weston. 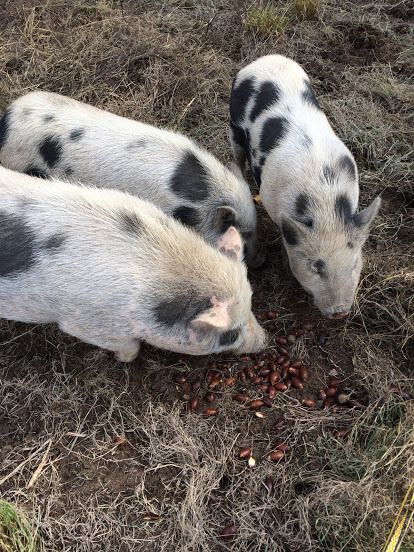 The larger pigs aren’t currently in the woods so we spend some time one afternoon picking up acorns in the woods to feed them – we think they appreciated the snack. 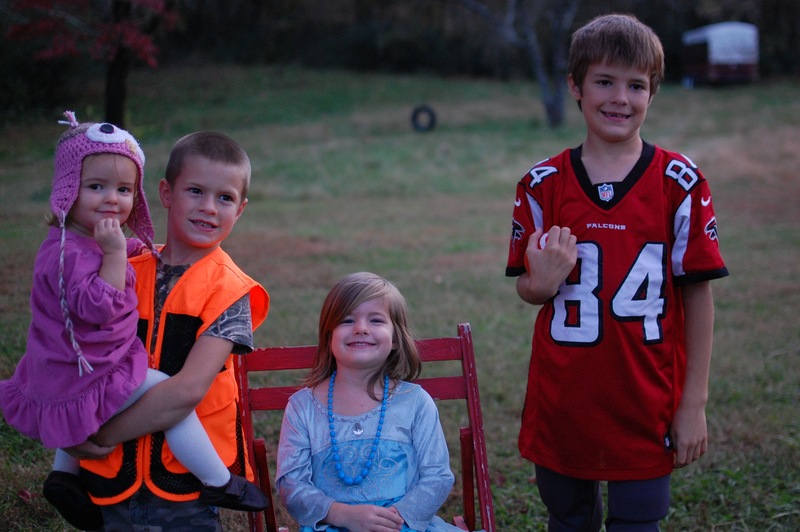 While we keep Halloween simple, the kids do enjoy dressing up and attending a Trunk or Treat at a local church. 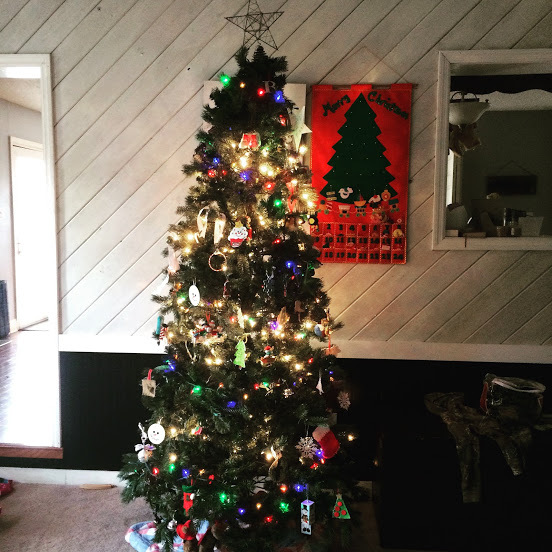 This year I told them we were dressing up using only what we already had – trying to keep the holiday eco-friendly and frugal! The did an excellent job. 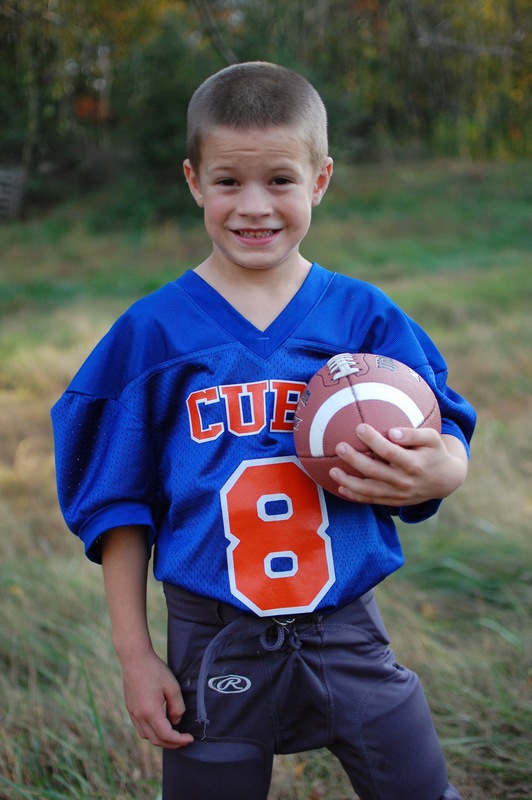 Paxton’s falcon jersey, football pants and cleats make a fabulous football player. 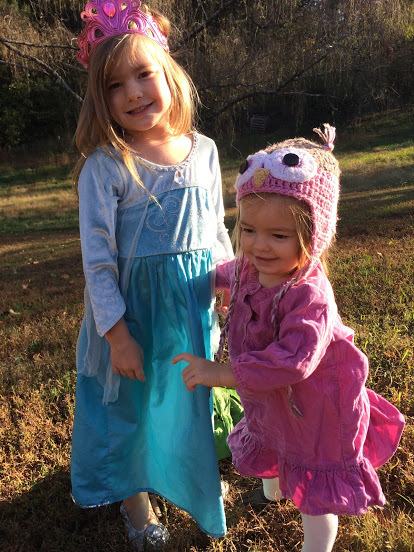 Weston pulled out his camo and blaze orange vest to be a hunter, Cecilia wore her favorite princess dress and I coupled a sweet little corduroy dress and owl hat that was handed down from Cecilia for Laura to be a baby owl. I love their excitement for dressing up and having fun! The prettiest little princess and sweetest baby owl I ever did see! We had a lovely September – savoring the last weeks of summer and starting to make preparations for winter. 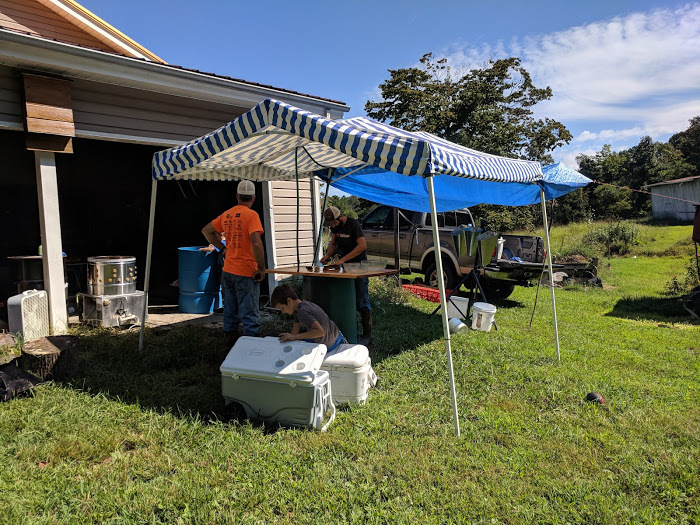 On September 1, we processed a second batch of meat birds. It was a fairly warm day and we had a shaded set up. 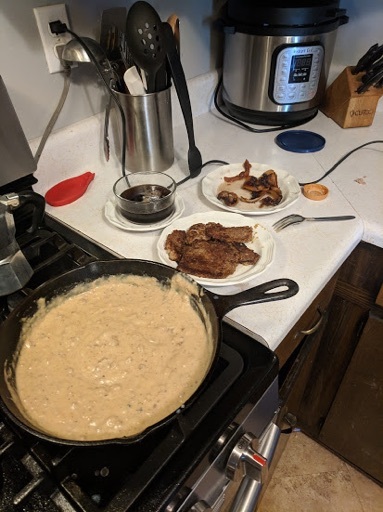 We realized we much prefer chicken processing with friends – we had friends that processed with us back in May and that made the work almost enjoyable. Laura tagged along for a little bit of the processing until it was nap time. 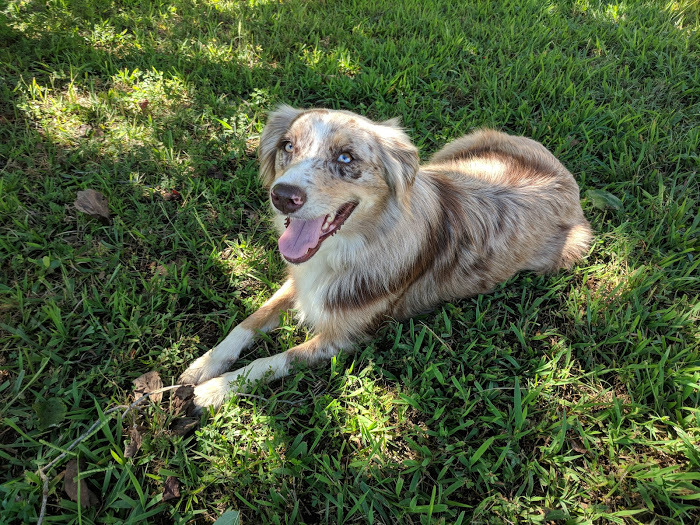 Copper enjoying a lovely late summer day. 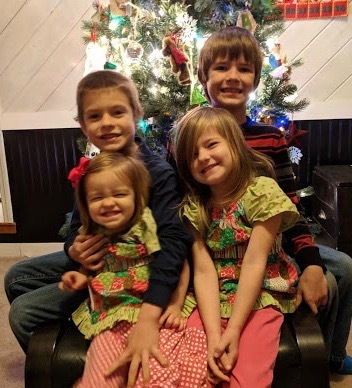 Our four kiddos ready for church wearing something other than play/farm clothes! Weston lost his first tooth September 2! 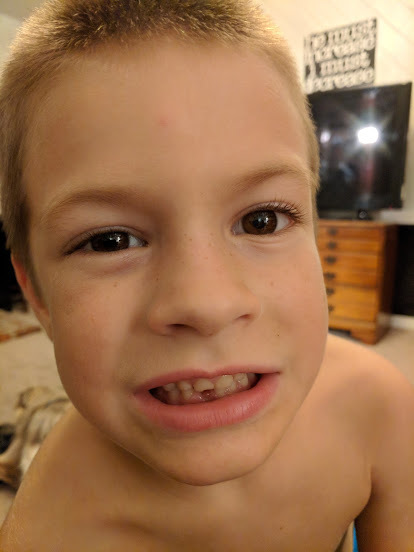 He was so excited and proud to have finally lost a tooth. 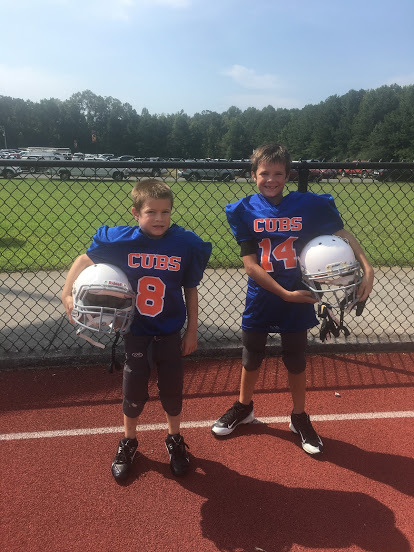 Our boys are playing football on the same team this year. 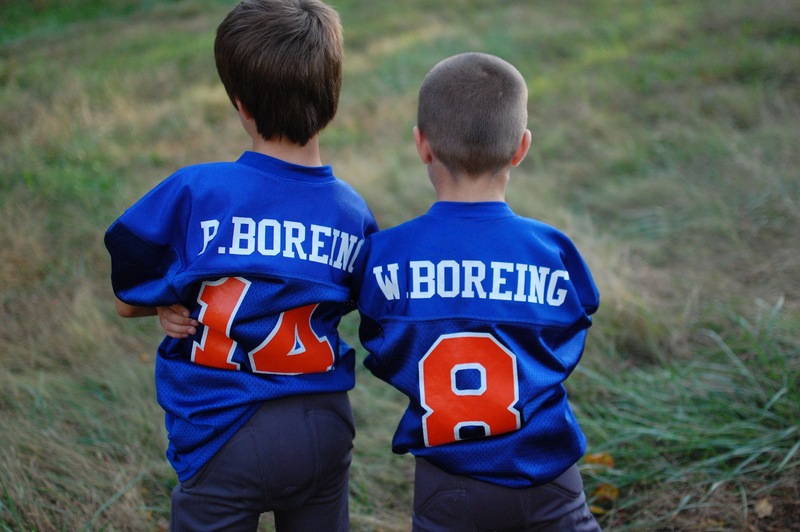 It’s fun watching them play together and they’re just too cute in their uniforms. They kicked off their season on September 8th with a jamboree. The sheep have been proving a bit difficult lately with getting out of their electro netting. 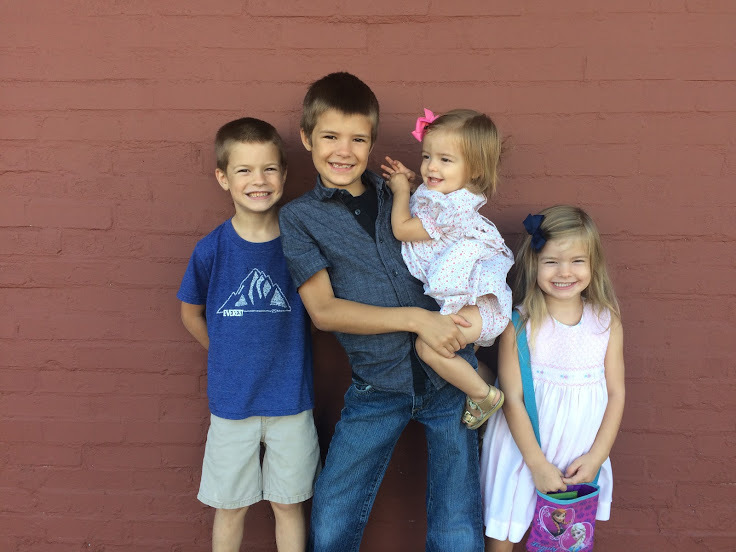 It always happens when John David is gone and more often than not happens when we’re needing to leave to go to church or an appointment. Hopefully we can get them to stay where they belong. And, each time they get out, I’m so thankful for Weston, he knows exactly what to go to get them where they need to go. 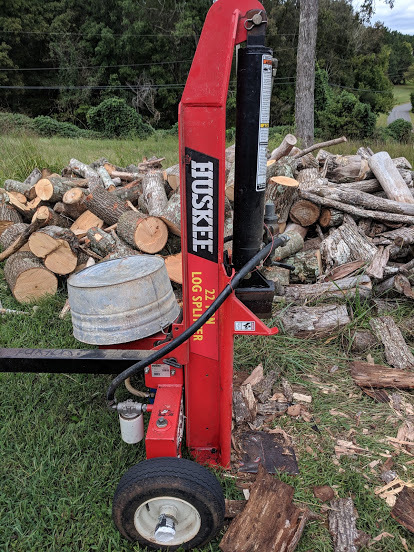 We purchased a log splitter this month to help manage our firewood supply. Splitting, cutting and stacking wood is a pretty enjoyable task. We’re all looking forward to cozy fall and winter evenings around the wood stove. 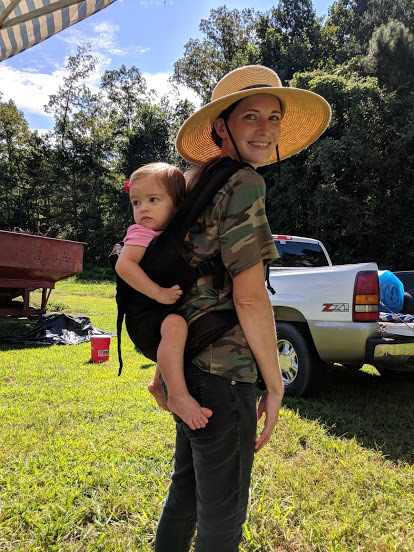 Ready for morning chores with little Miss Laura. She loves going outside visiting the animals and checking for eggs. I enjoy having her tag along with me. 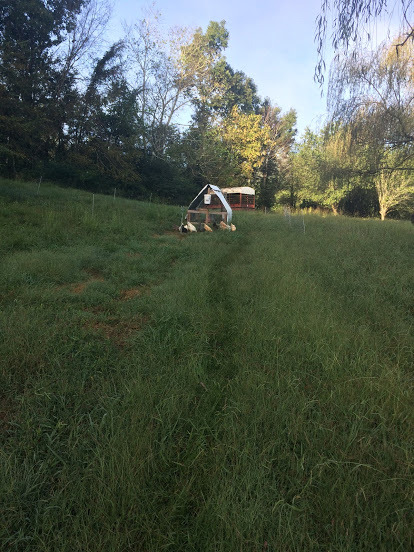 We are currently rotating our layers on pastured behind the sheep. 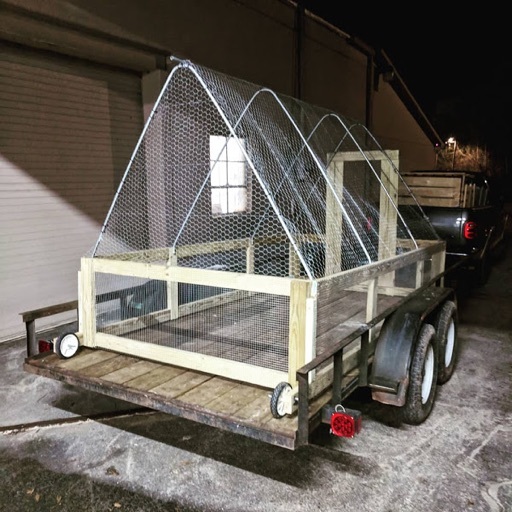 They are roosting and laying in a mobile chicken tractor and we have them fenced in with poultry netting. 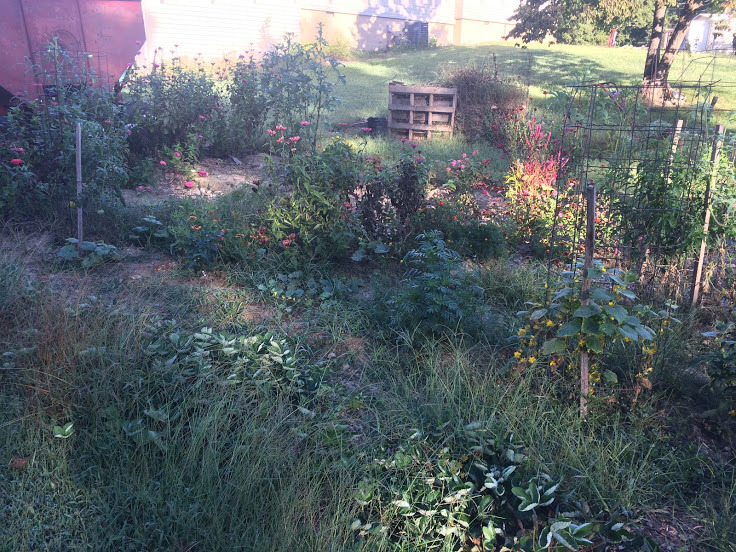 Our lower garden as it looked on September 18. So many lovely flowers still blooming! I really enjoy this space. 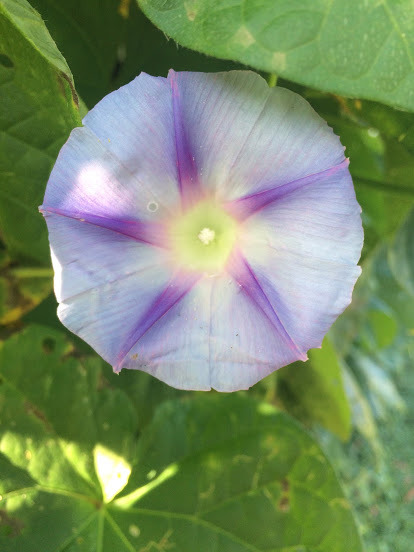 I planted morning and evening glories all around our pool and the lattice around our screened in porch and they are just so lovely. Some are white and some are purple and this one was a blend of white and purple! Celebrating the first day of fall with a dip in the swimming pool. 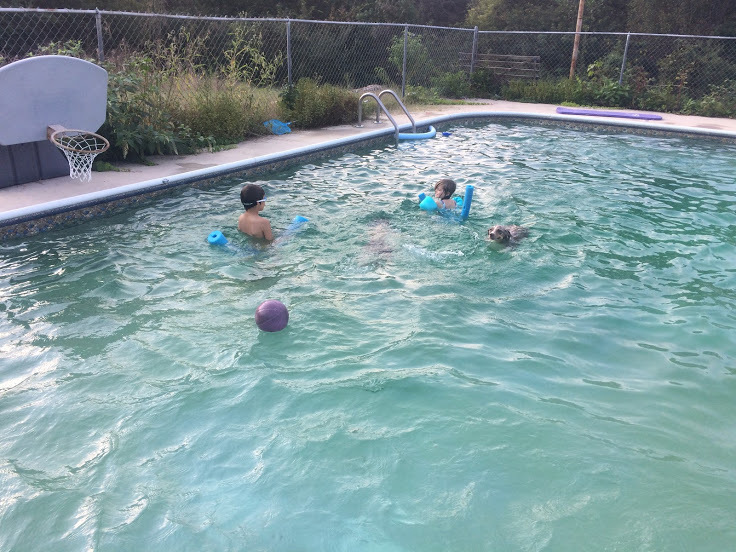 It’s been quite warm so we’re enjoying the pool as much as we can. 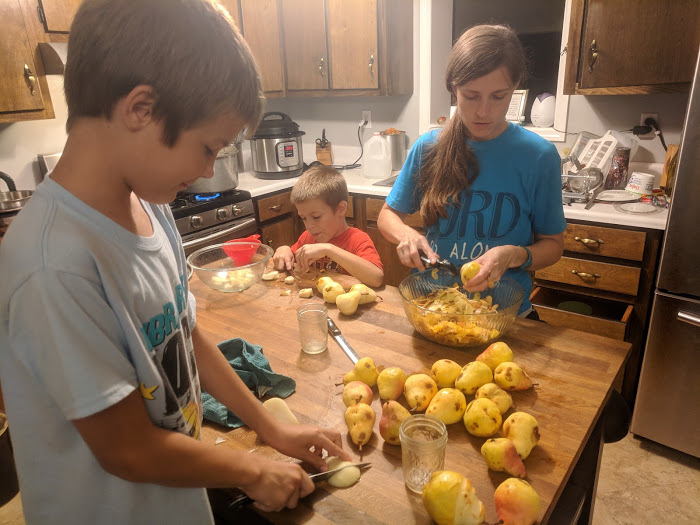 I ordered 20 pounds of pears and 80 pounds of apples from Azure Standard this month so our kitchen turned into a pear and apple sauce processing facility. 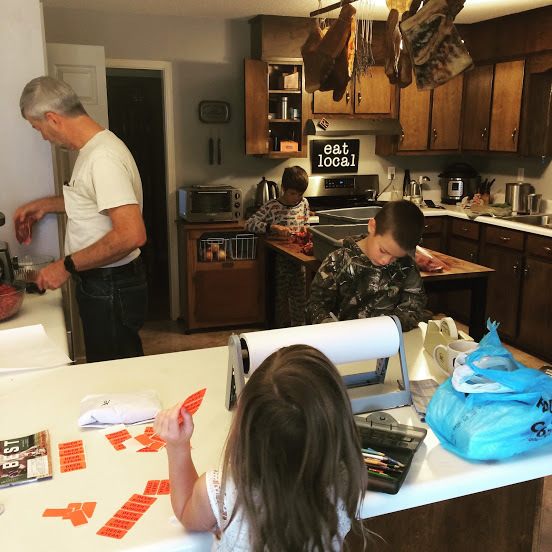 These kiddos are big helpers with slicing and dicing. 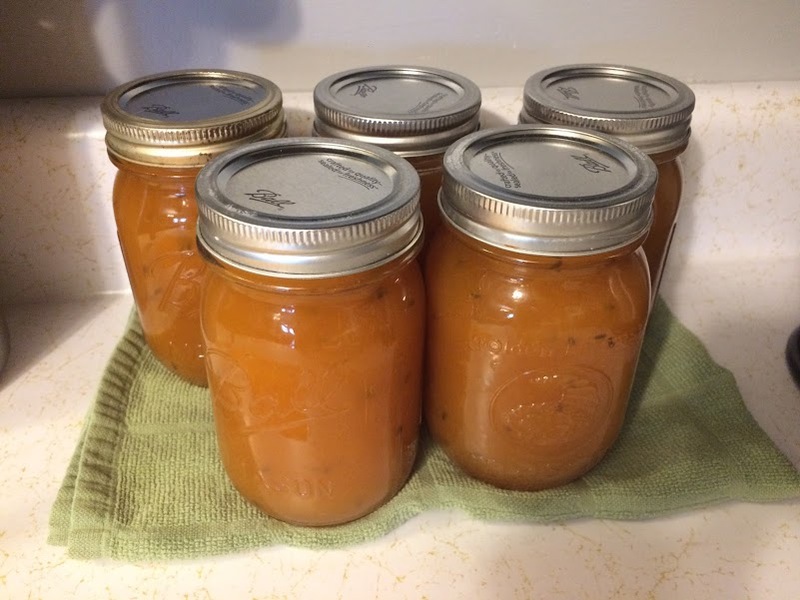 The fruits of our labors – applesauce and pearsauce. We’ll enjoy these sauces during the winter on sourdough pancakes or eaten alone. 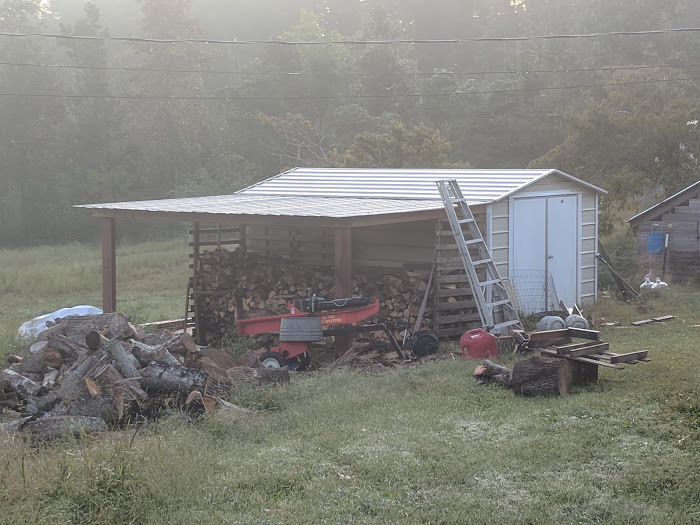 John David spent a chunk of this month working on extending the roof off of our storage shed to make room for wood. 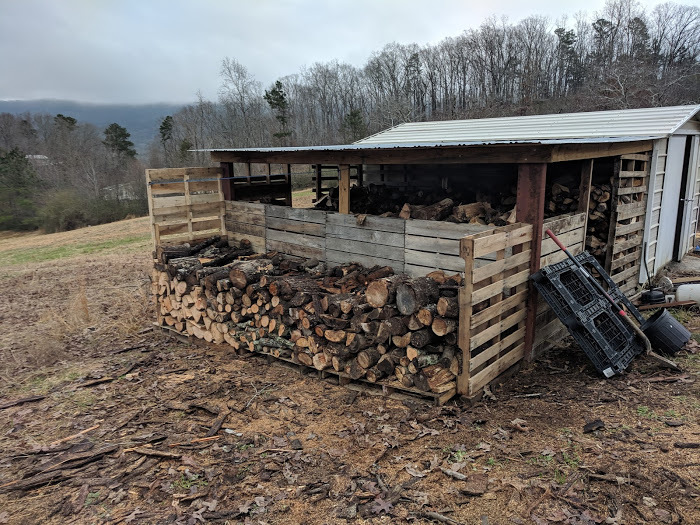 It looks great and it’s been fun to split and stack wood and watch it fill up. We separated 4 of the 5 piggies from their mama now that they’re old enough to be weaned. She’s not been the friendliest towards us since they were born and they’ve been very skittish. We’re hoping now that they’re away from us they’ll become much friendlier and realize that we’re friends. They were too cute snuggled up together on a chilly morning. 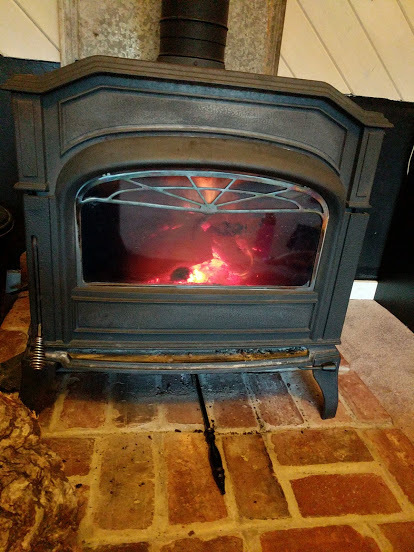 We’re looking forward to cooler weather, starting the wood stove and enjoying the lovely month of October now that September has drawn to a close. We enjoyed the month of August – it was full of enjoying warm summer days, preserving what food we could from the garden and back to school. 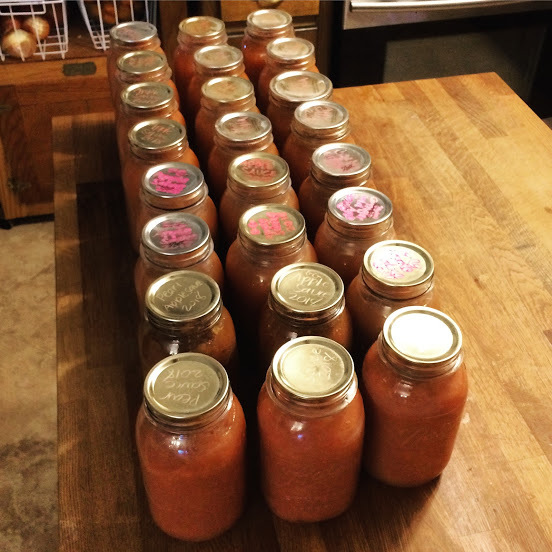 In early August, I purchased 40 pounds of organic peaches and we canned half peaches, peach jam and peach butter. It will be nice to enjoy the taste of peaches in the middle of winter. 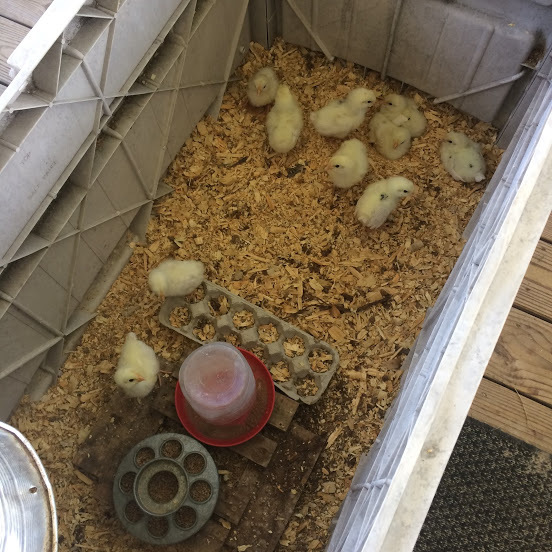 We also purchased 10 more California White chicks to brood. We had 2 from our late winter brooding and they have proven to be consistent layers so we decided to get a few more. This will be the last batch of chicks until next spring! 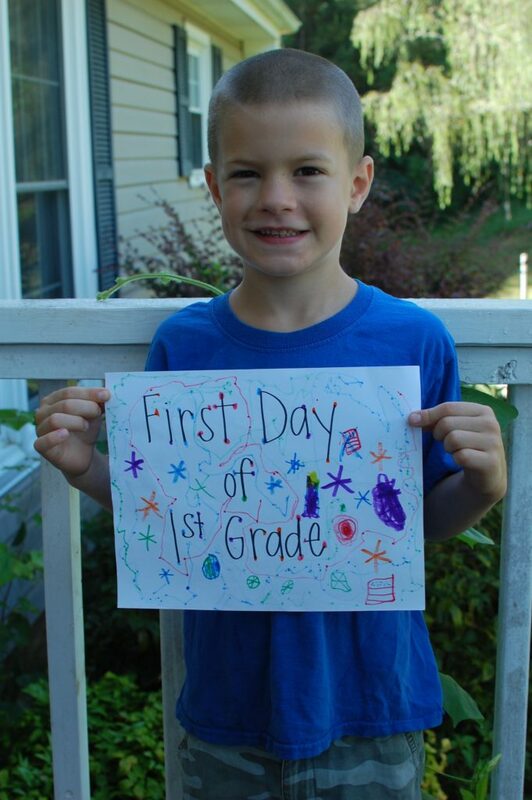 We started our school year on August 6. 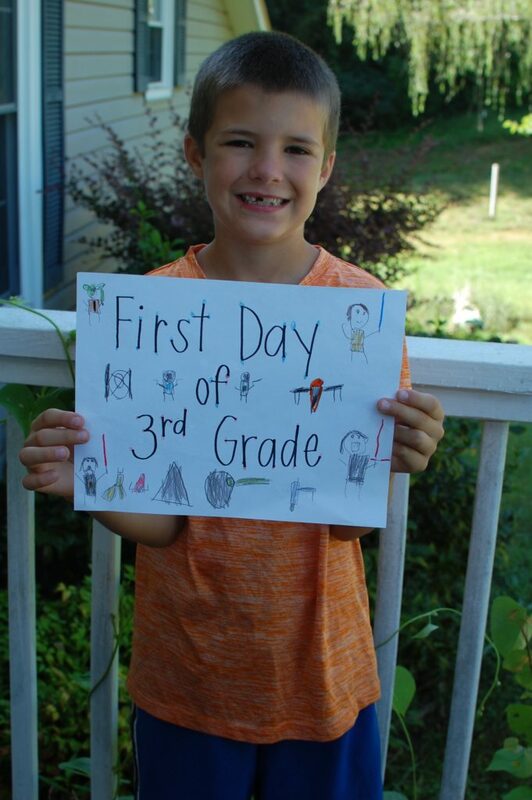 Paxton started 3rd grade. 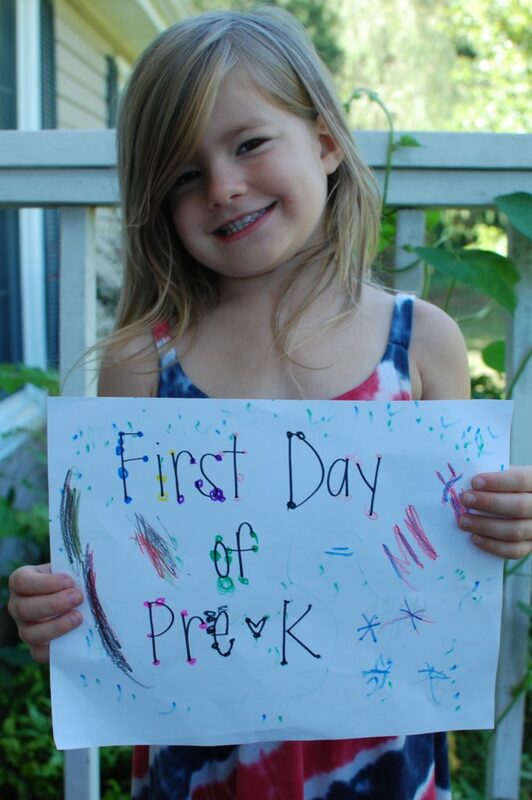 Cecilia is in Pre-K this year. 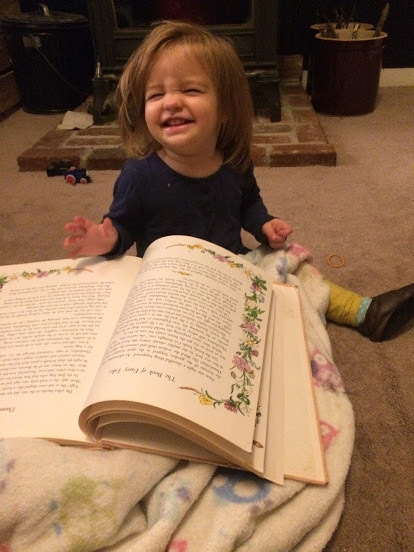 And sweet little Laura is just here listening to all kinds of good books and taking it all in! 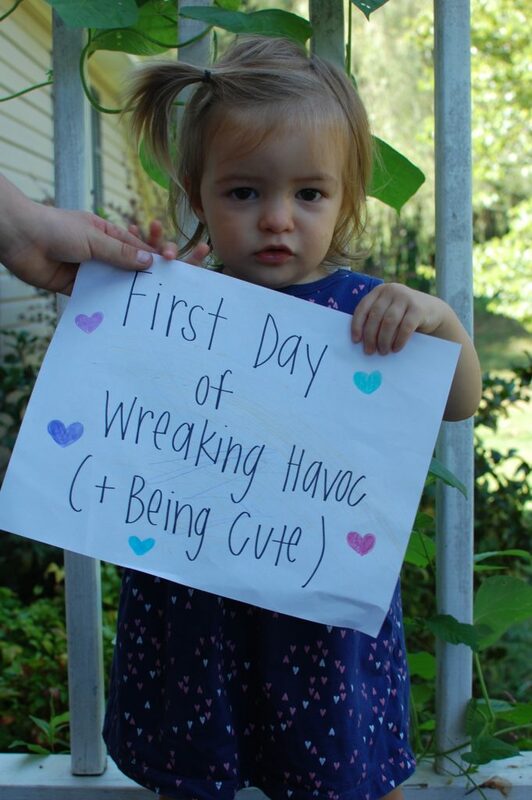 Not the happiest start to our school year but she’s cute even when she’s crying! Cecilia loves helping in the kitchen. 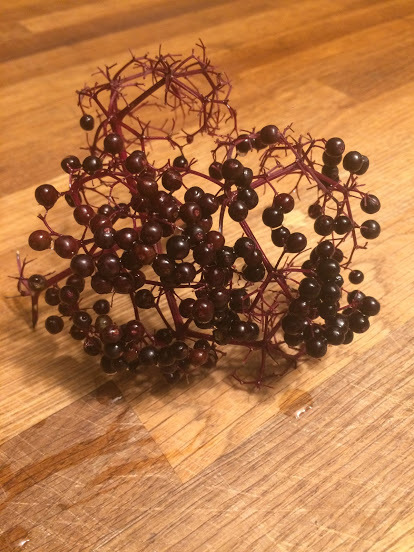 Our elderberry harvest. 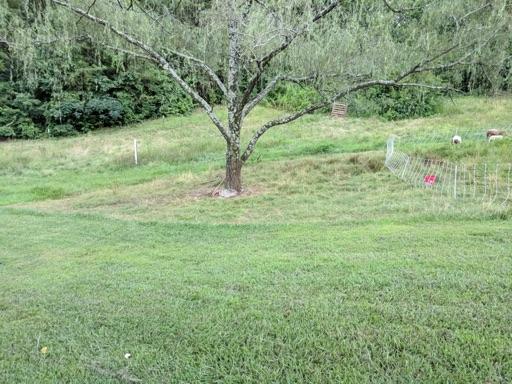 We planted 4 elderberry plants and then had 2 wild elderberry plants come up in the pasture. Unfortunately the birds love the elderberry so there wasn’t much to harvest this year. 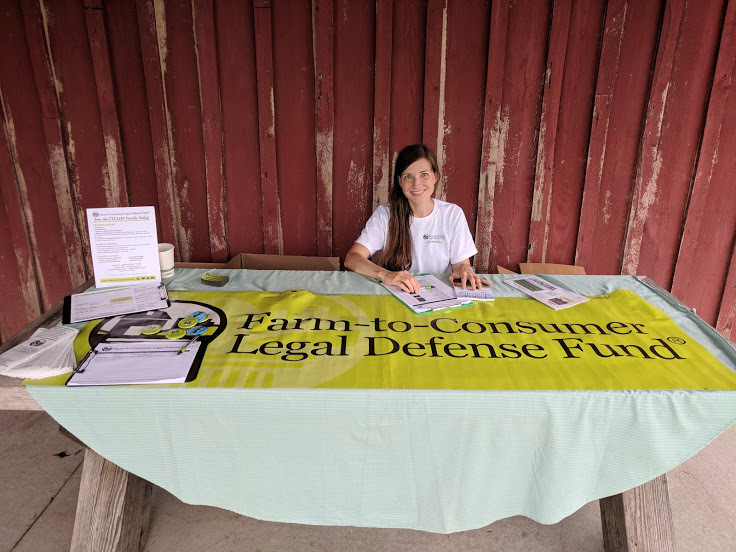 On August 10, John David and I went to Kentucky as Volunteers at the Farm-to-Consumer Legal Defense Fund’s Profitable Farm Worskshop. We enjoyed working the registration desk as well as taking photos throughout the event. 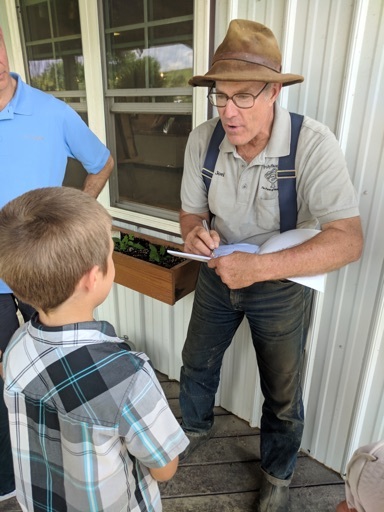 The highlight was being able to attend the workshops – especially hearing Joel Salatin speak. 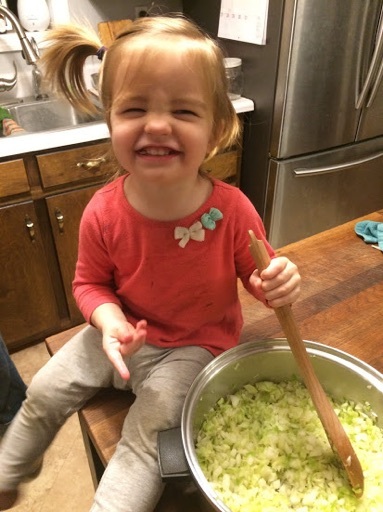 The sweetest little kitchen helper. Laura sits on the counter quite a bit as I prepare meals. 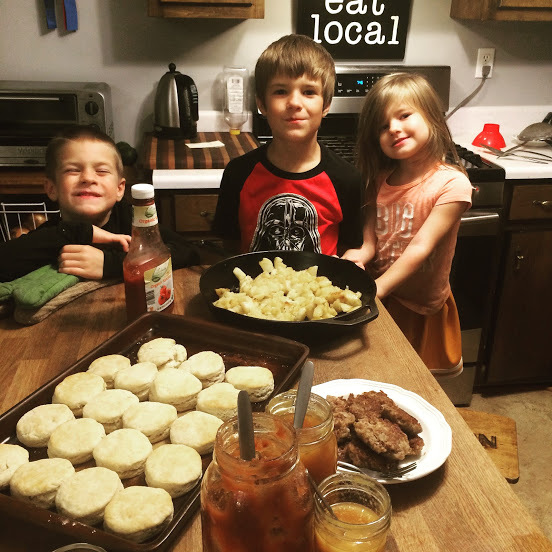 This is a meal we hope to be able to enjoy more of in the future – everything pictured on this plate was grown here on the homestead! 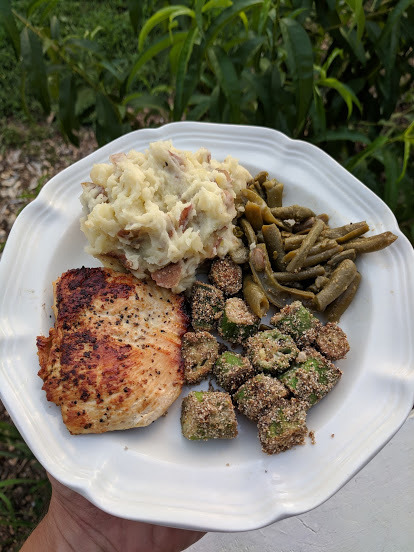 Chicken breast, okra, green beans and potatoes. It was such a delicious meal. The flowers are still blooming quite prolifically and we’re keeping cut flowers in the house at all times. 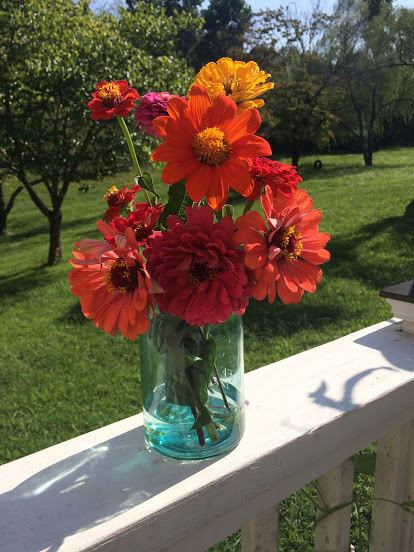 Our Zinnias, Marigold and Mexican Sunflower are some of my favorites. Love living this life with him. 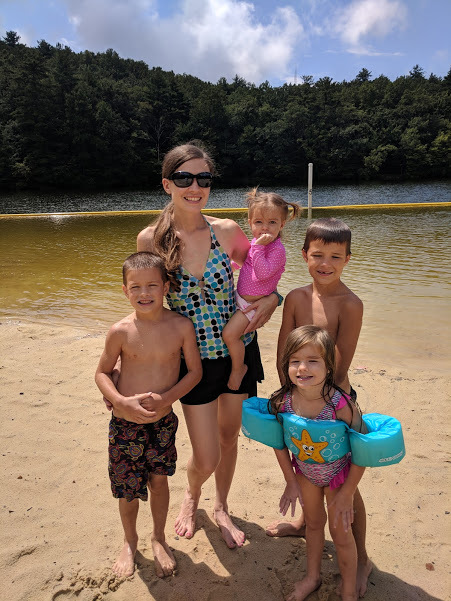 On August 29, we took a little day trip to a local state park to hike, picnic, swim and just enjoy the summer and time together. Laura really enjoyed her hike! 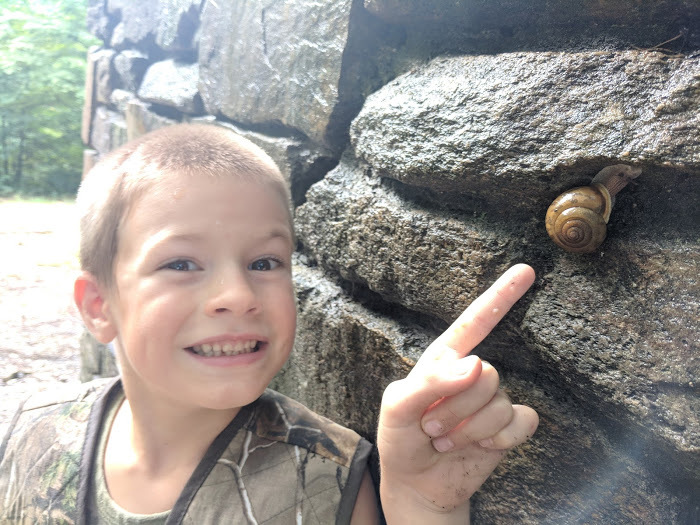 While we were picnicking, Weston explored the area around the picnic shelter and found a large snail that he was quite excited about. This boy loves nature. We enjoyed a dip in the mountain lake. Since it was the middle of the week, there were only a handful of people there other than us. I’m a little sad to see August go, but have so many fun memories from this month. July was such a fun month thanks to gardening. It has been so much fun for all of us to walk out to the gardens and come back nearly every time with something to eat. The girls and I love snacking on cherry tomatoes and the boys rarely make it inside with the cucumbers they pick! 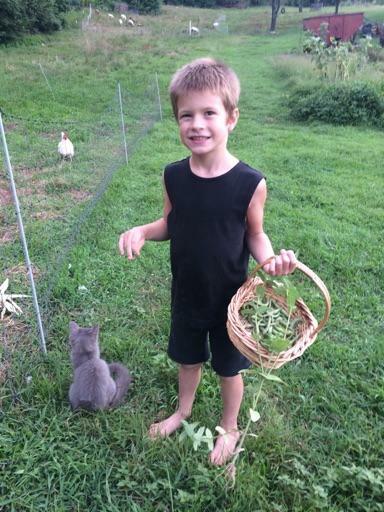 Paxton had his own section of garden this year and he has had fun harvesting cucumbers, carrots and flowers of his own. He has a cantaloupe that is just about ready and he is very excited about that harvest. 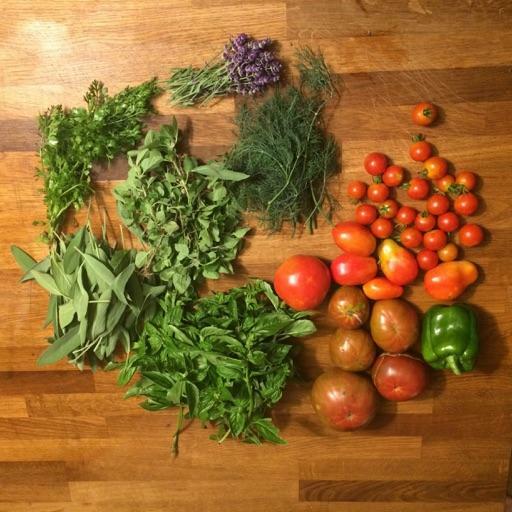 One of our herb harvests. 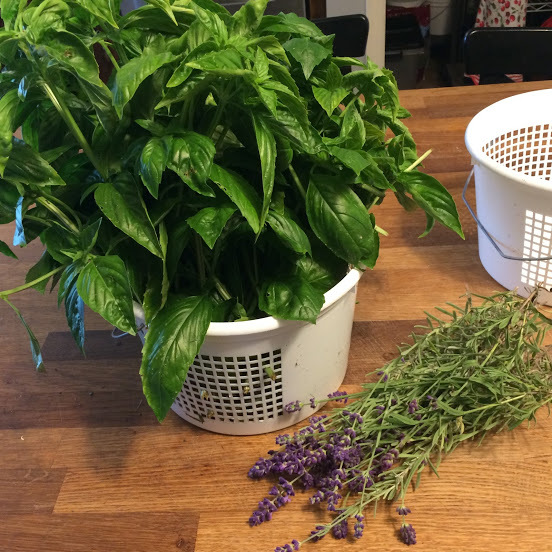 We have had success with basil, sage, oregano, cilantro, dill and lavender this year. My parents were here in early July and helped us to pressure can our first batch of green beans. 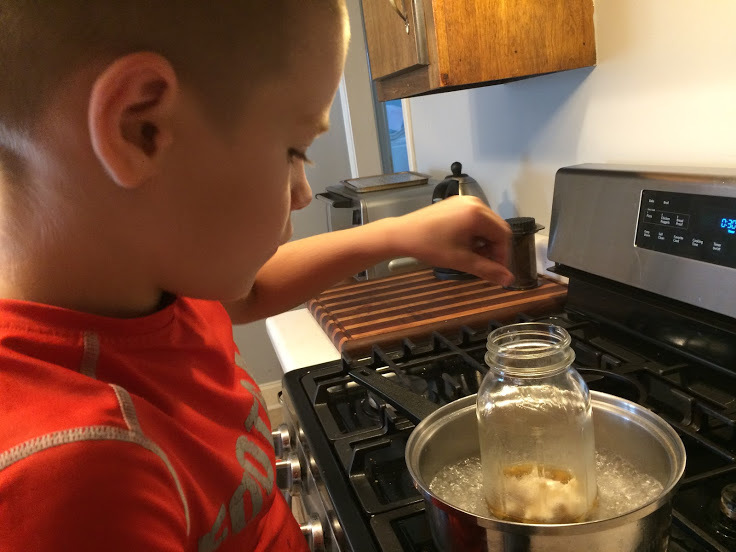 This was our first time pressure canning anything and it’s a simple process! 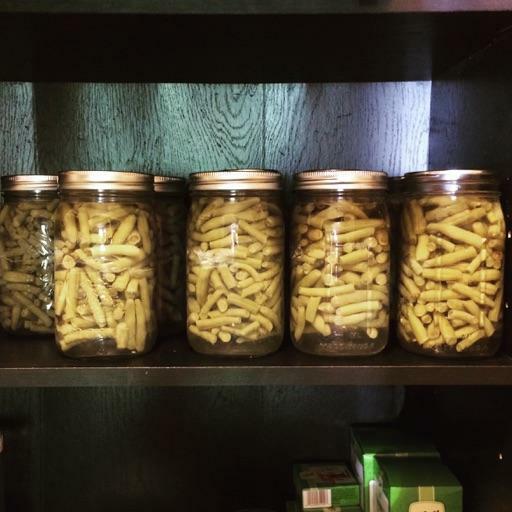 We’ve canned 17 quarts of green beans this summer which isn’t a ton but it’s a good start. I already have plans to plant many more green beans next summer. 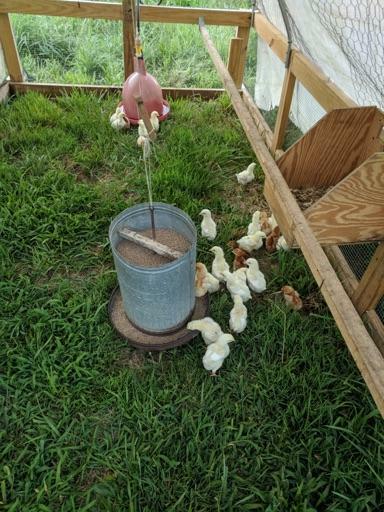 We had meat chicks hatch on July 2 and 3. We have 19 of them and they’re doing great, scheduled for processing at the end of August. 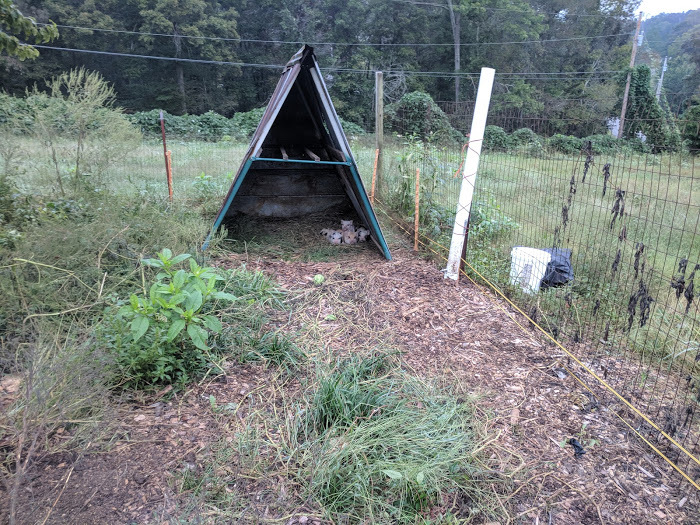 Click here if you’re interested in purchasing Pasture Raised non-GMO Chicken. 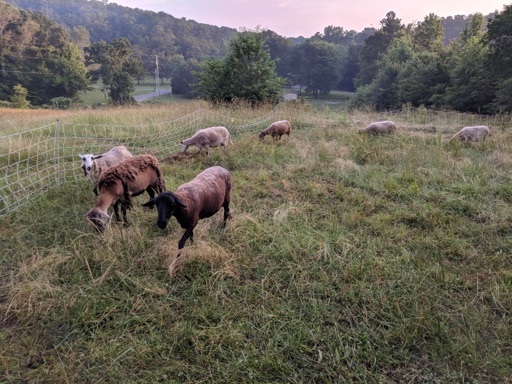 We’ve been rotationally grazing our sheep and it’s so much fun watching them clear pastures. You can see in the above photograph where they had been the day before and how much they ate down. Speaking of our sheep, which we love, we had a sad day on July 5 when Blossom died. We’re not entirely sure what happened, we found her one afternoon tangled up in the electro netting. All we can figure is she was attempting to escape (as she often did) and was shocked which scared her and she starting fighting the netting and somehow hung herself or maybe died of fright/exhaustion because it was a very hot day. I found her while the kids were inside and had a good cry and then broke the news to the kids. It’s never easy to lose an animal but it’s especially hard to lose your favorites and even harder when it’s a tragic death. 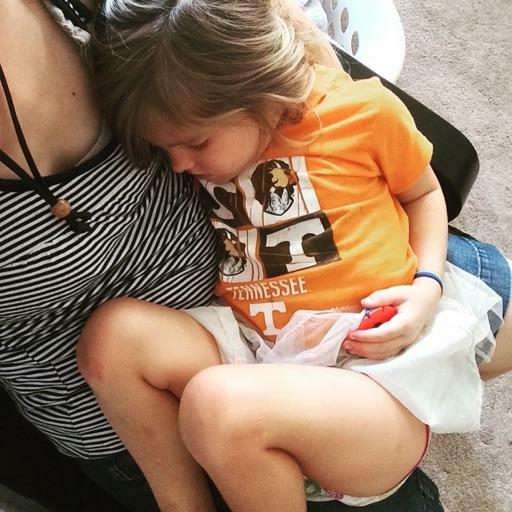 Sweet Cecilia cuddled up with me one afternoon and fell asleep. In moments like this, all the work can wait! 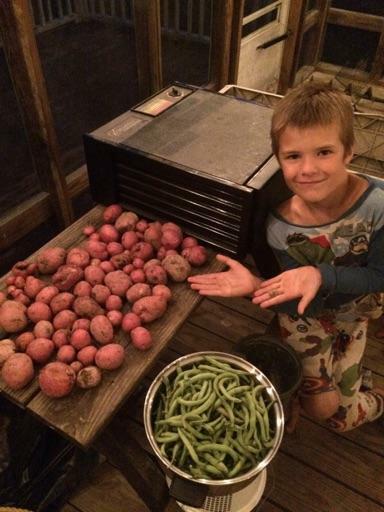 Another harvest! Our cherry tomatoes have done well this year – much better than our other tomatoes. 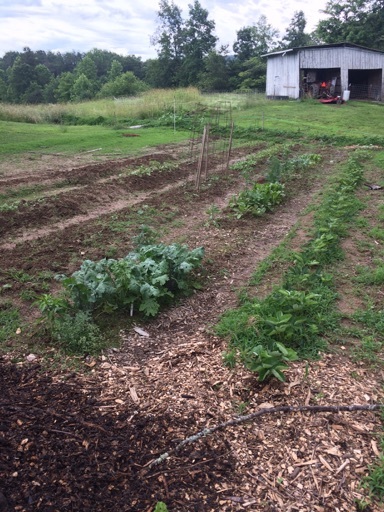 We also had a beautiful patch of black eyed peas (pictured in upper right corner). The plants did great but they take up a lot of space for a fairly small yield so we don’t know if we’ll plant those next year. 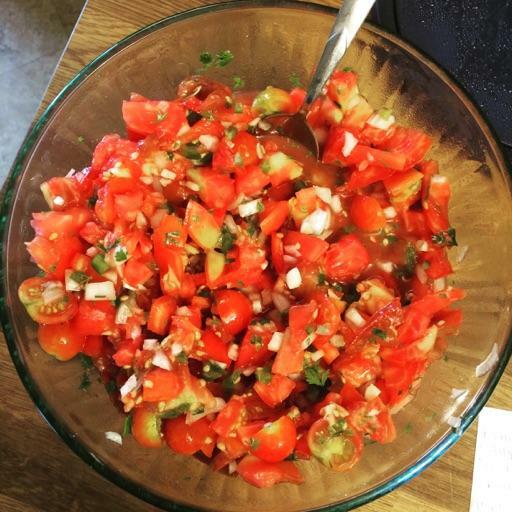 One of our batches of salsa made with cherry tomatoes, jalapenos and cilantro from our garden. Our tomatoes have not done great this year. The plants themselves were all fairly small but they actually put on a lot of fruit. However, the fruits just didn’t ripen well plus we have battled tomato sucker bugs which have damaged some of the tomatoes. 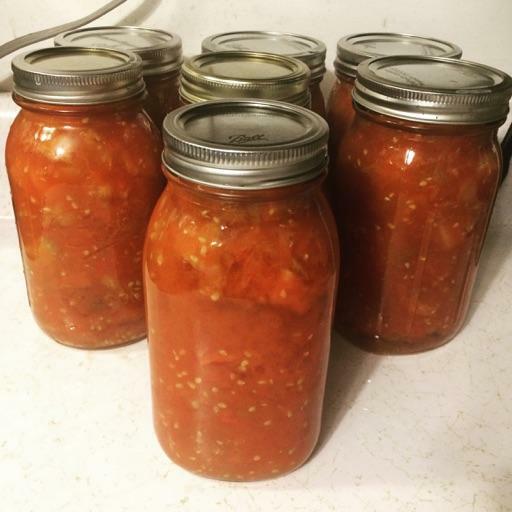 We have only canned 7 quarts to date which is disappointing but that’s the reality of first year gardening on soil that needs more rich organic matter added to it. The kids have been into art lately. It’s amazing what a pack of white copy paper can inspire. They’ve all been drawing all kinds of pictures and it’s been fun to see what they create. 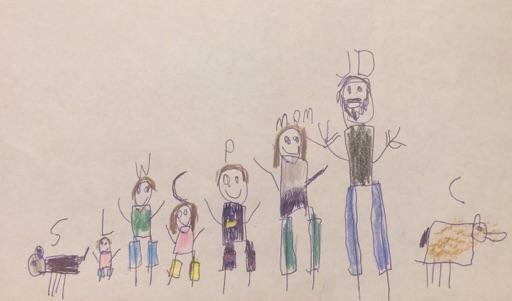 Paxton drew this cute picture of our family – including our dog and cat! Love it. 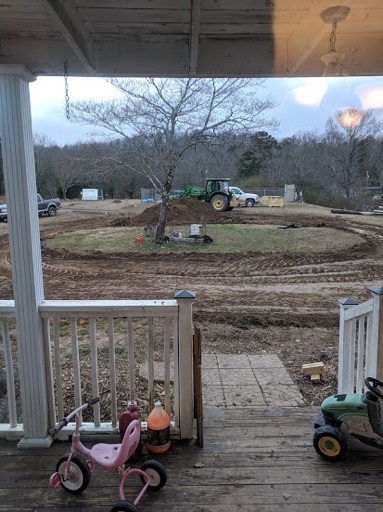 This year we have 2 gardens. 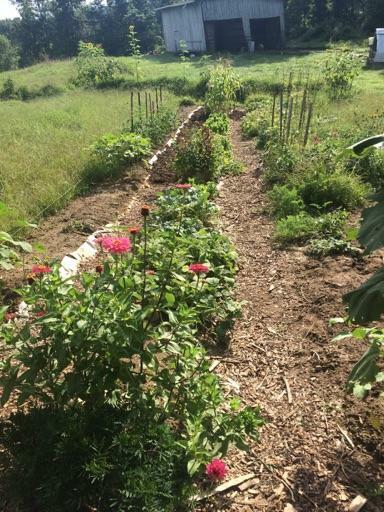 We call them the upper garden which is the one in front of the house as you pull into the driveway. The other is called the lower garden which is located in a little valley between the house and barn. 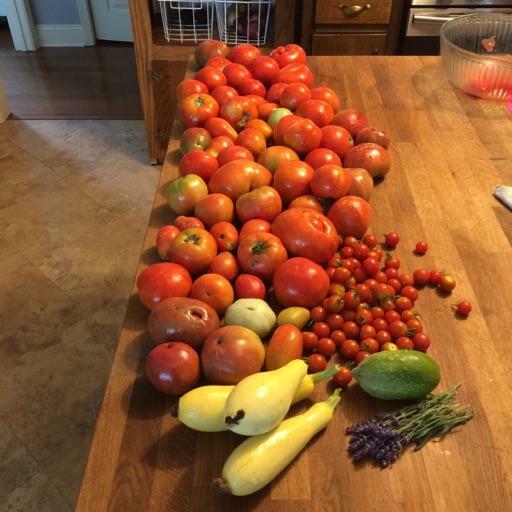 Since this is our first year gardening more traditionally (we gardened in raised beds at our other house), there is a bit of a learning curve and we probably planted too much! But, we were excited and sometimes you learn more from your mistakes so it’s not the worst thing that could happen! Anyways, I managed to keep the upper garden fairly decent through the beginning of July but the lower garden was nearly taken over by weeds. I worked all during July trying to reclaim the lower garden and it’s looking great but now the upper garden looks more like a weed patch than a garden! You win some, you lose some. Weston on one of our evening walks to the garden and to visit the animals. He’s holding a basket with some fresh veggies. On this evening, Weston, Laura and I were looking at the chickens and I looked over to see Cecilia with a pipe through the pig fence. 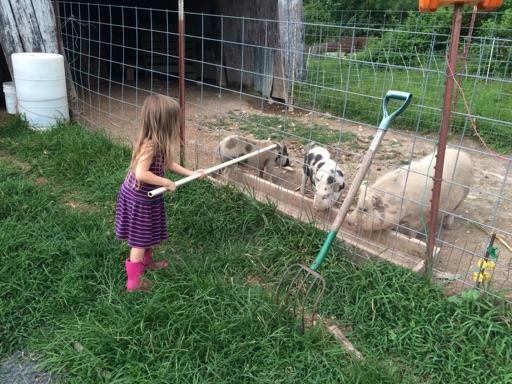 It took me a second to realize that she was trying to scratch the pigs. 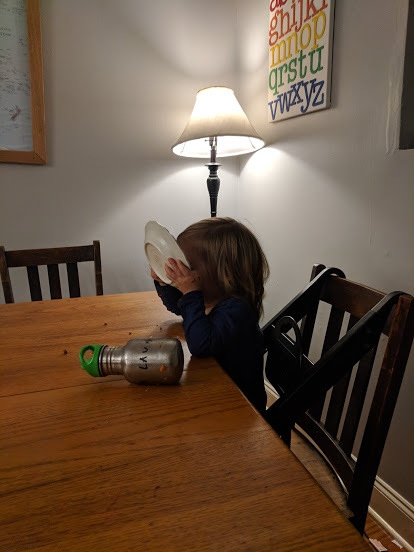 I watched her for several minutes without saying a word. It was pretty cute. She succeed in giving both of the piglets a scratch. Weston really enjoys helping me in the kitchen. 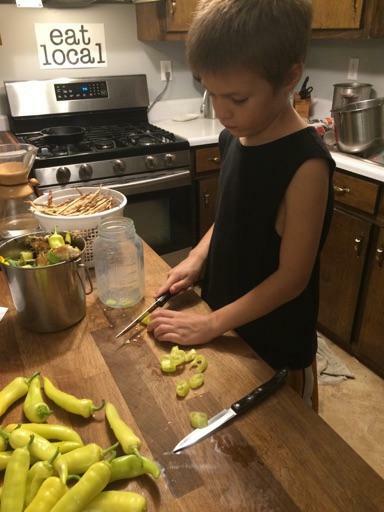 We had a fairly decent banana pepper harvest that we were able to ferment. He helped me cut the peppers into rings which was a big help. 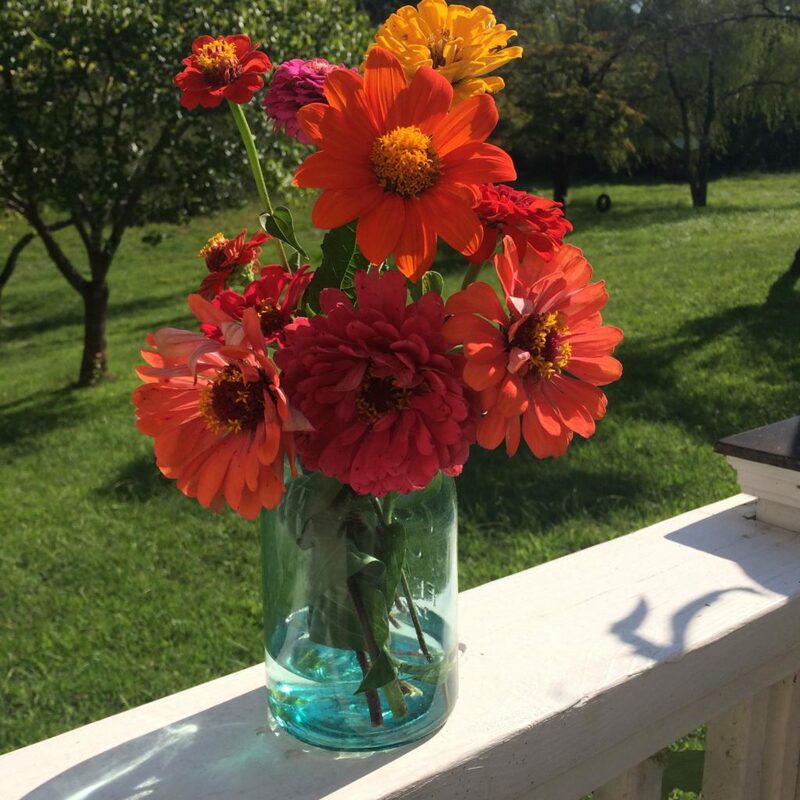 Zinnias are one of my favorite parts of July! 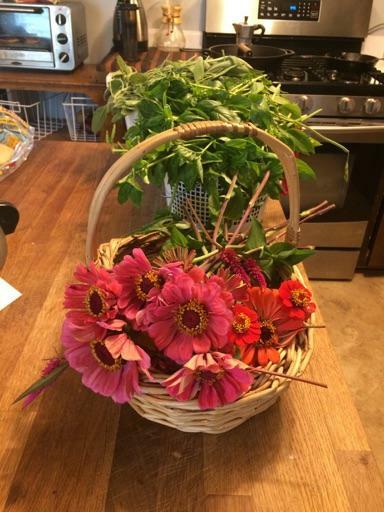 We planted zinnias all over the gardens and property this summer and I just love harvesting them. I keep a fresh bouquet in the kitchen and have enjoyed giving some fresh flowers to friends and Weston’s egg customers. I made several batches of soaps in July that will be ready to sell in August! I’ve been making soap for a year now and it’s the only soap we’ve been using in the shower and as bathroom and kitchen hand soap. I’ve even been experimenting with shampoo bars which I hope to be able to sell in the future. 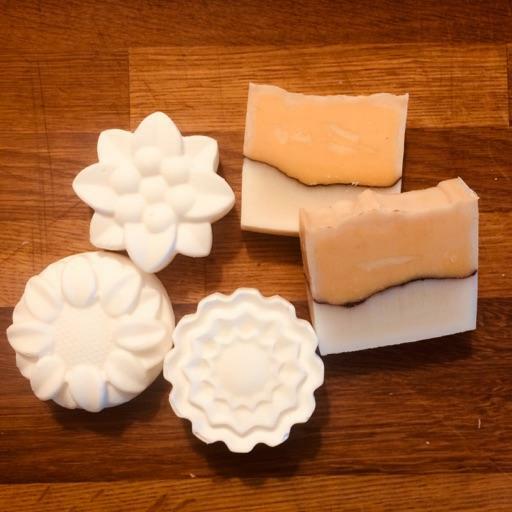 I purchased new soap molds this month and am loving the fun flowers and the ability to make layered soaps. If you’re interested in purchasing soaps, we have several different soaps available at different price points. 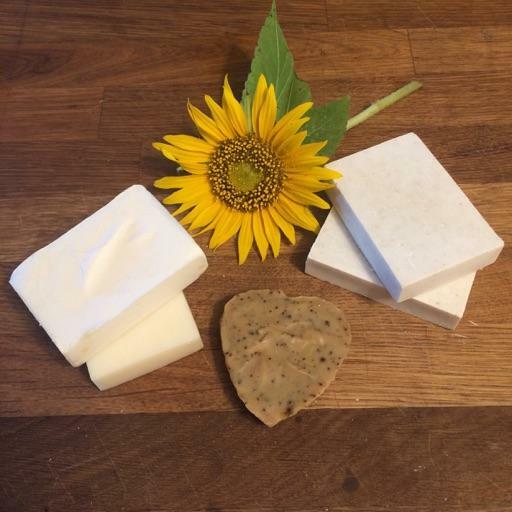 All of these soaps are made using natural fats/oils and contain no artificial colors or fragrances. 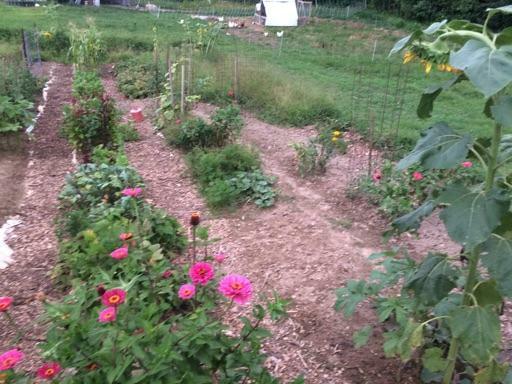 We’re looking forward to all that August holds and planning our fall garden. June is such an exciting month – the garden really starts to take off and it’s just so exciting to watch plants rapidly grow and begin to fruit! 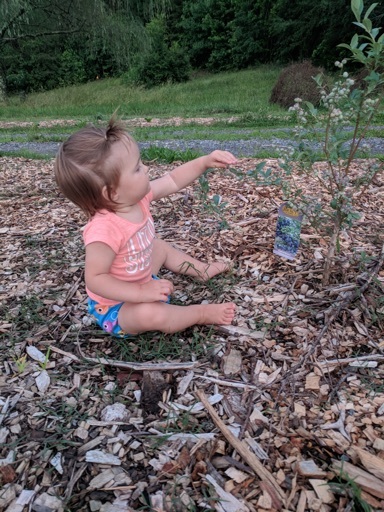 Laura has found our blueberry bushes and discovered that she loves blueberries – blue, pink or green! Yes, she was nibbling unripe berries and seemed to love them. We planted several small blueberry bushes late last fall and allowed a few of the larger ones to fruit this summer (the majority of them we pinched blooms off of). In a few years, we should have abundant blueberry crops! 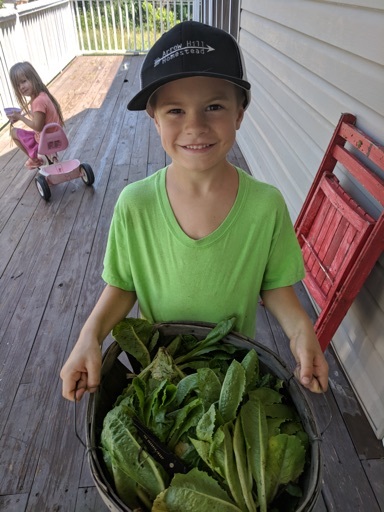 Weston was so excited to harvest some romaine lettuce. Love this little farmer boy! 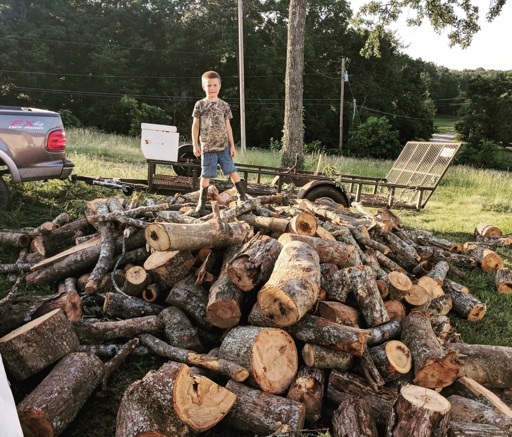 John David found firewood from a family who cut down a few trees in their back yard. He got one load and then the kids and I went back with him for another load. We’re thankful for free firewood! 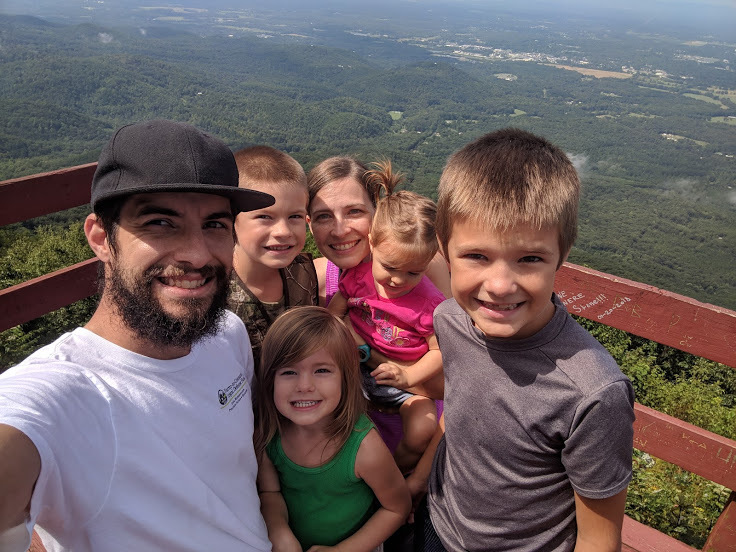 We took a quick trip to East Tennessee to visit John David’s parents and Virginia in early June to visit Polyface. 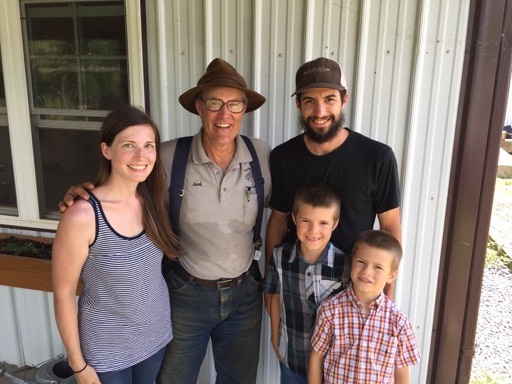 We enjoyed seeing the operation firsthand and loved meeting Joel Salatin! 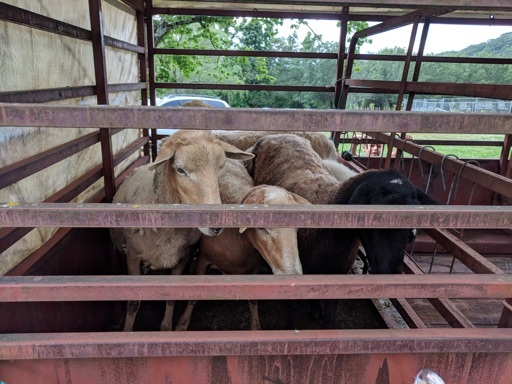 On June 10, on our trip home from Virginia, we purchased 5 ewes. 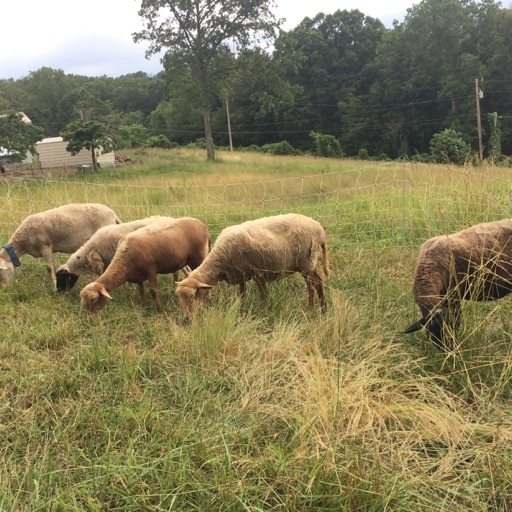 They had been raised on pasture at Foggy Knob Farm, a similar sustainable operation. They were reducing their sheep and needed to sell a few ewes. We were very excited to be able to purchase these lovely ewes. They’re Katadin/Dorper/Tunis crosses and are very docile. 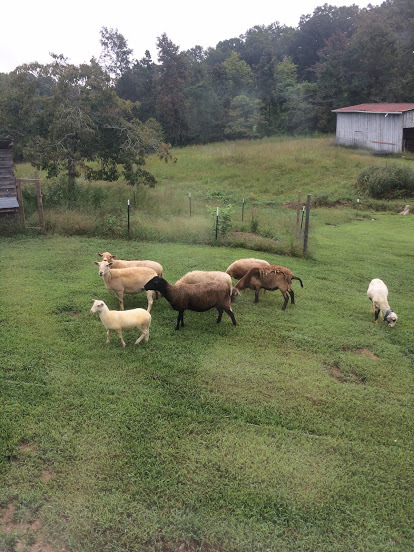 Weston actually purchased Sunny (the black headed one) with his own money, increasing his sheep flock to 3 ewes. 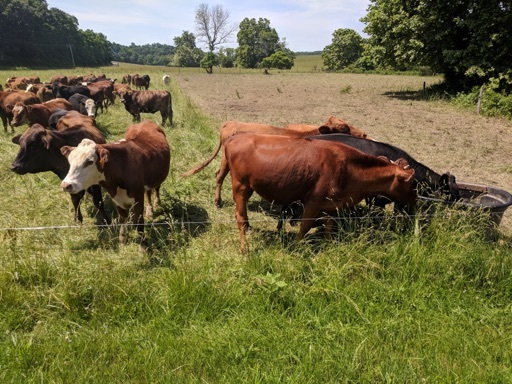 We’re excited to have more ruminants out on pasture – we have so much grass that needs to be consumed! It’s so relaxing to watch the sheep graze. They’re such calm and graceful animals. On the morning of June 16th, Weston came running into the house shouting “Callie had her baby!! 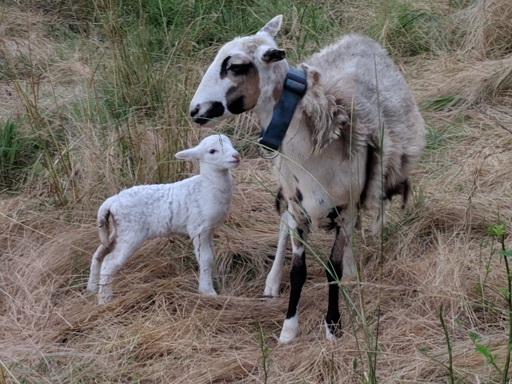 There’s a baby lamb!” His ewe, Callie, had lambed sometime during the night and there was an adorable solid white ewe lamb in the pasture! 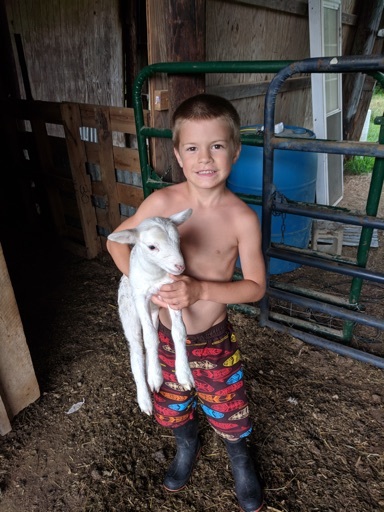 Weston and his brand new baby lamb. He is so proud and now has a total of 4 sheep. 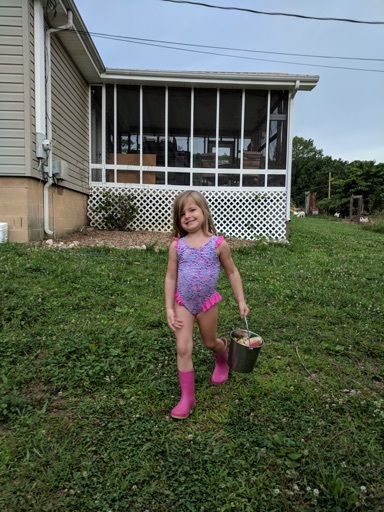 Farm Girl Cecilia bringing scraps out to the chickens in her bathing suit and pink rubber boots – she’s so girly yet enjoys life on the homestead too! 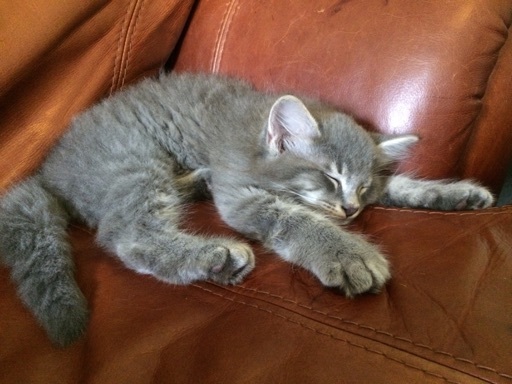 On June 21, we picked up our new kitten, Smokey. He was 8 weeks old that day, born April 26th. 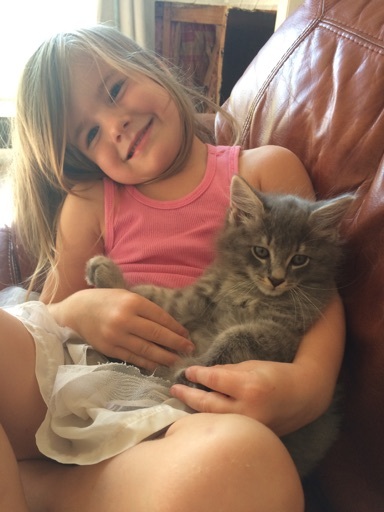 We decided to get a kitten so Cecilia would have a pet of her own to take care of, so Copper could learn to get along with cats and to hopefully keep mice/rats away from the house. He’s sweet as can be! 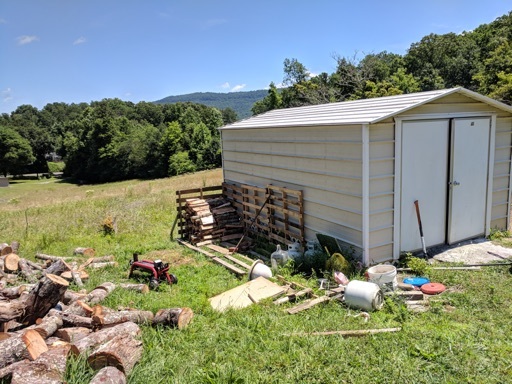 John David started assembling a woodshed on the side of our storage shed. We’re trying to make it out of as many salvaged materials as we can scrounge so it may take a couple of months to build but it’s exciting watching him build it and knowing that we should have it full of wood by the time winter arrives. 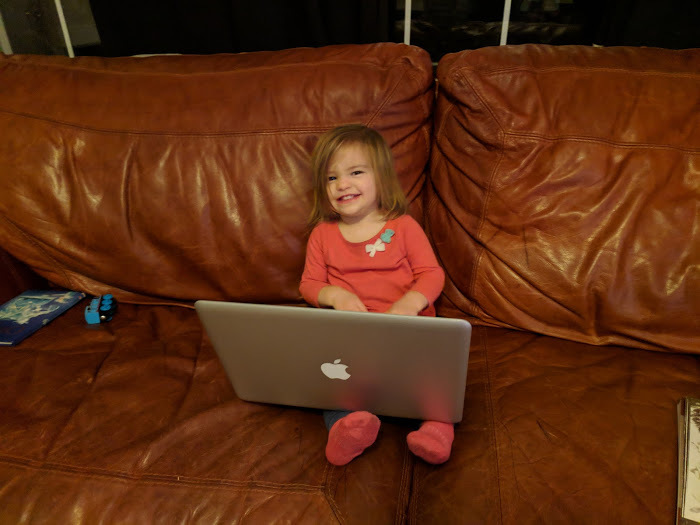 Laura is now 13 months old and seems to grow and change every single day. 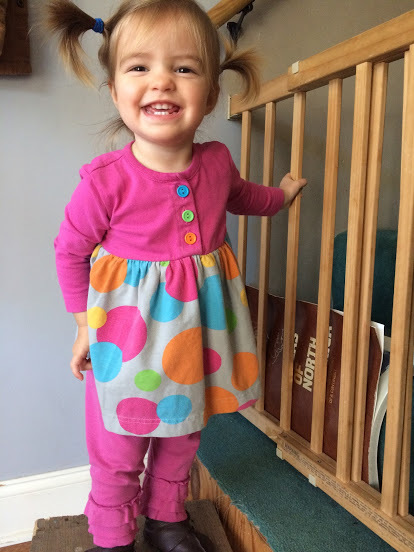 Once babies pass 12 months, they quickly turn into miniature people and it’s so much fun. 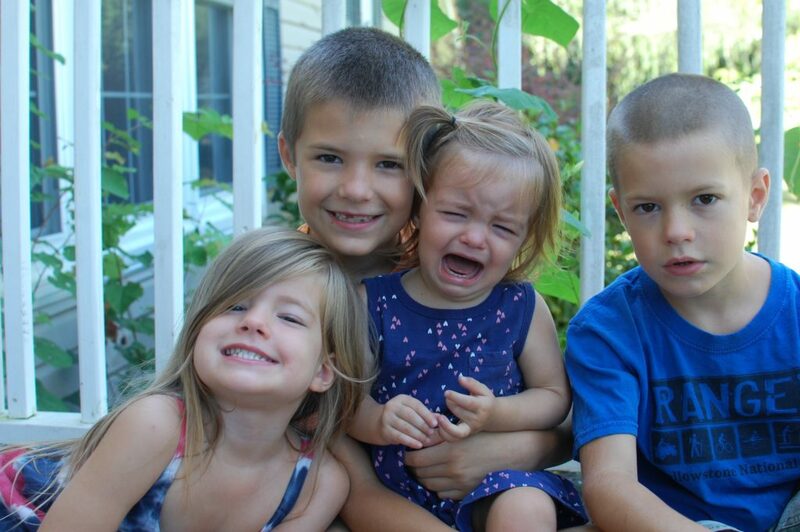 With 3 older siblings, she’s tough and determined. 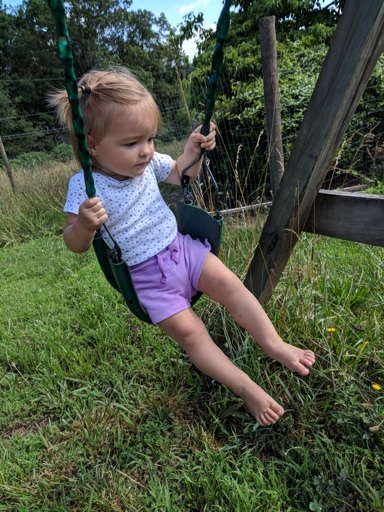 She wanted on the swing and held on just fine – it was adorable! 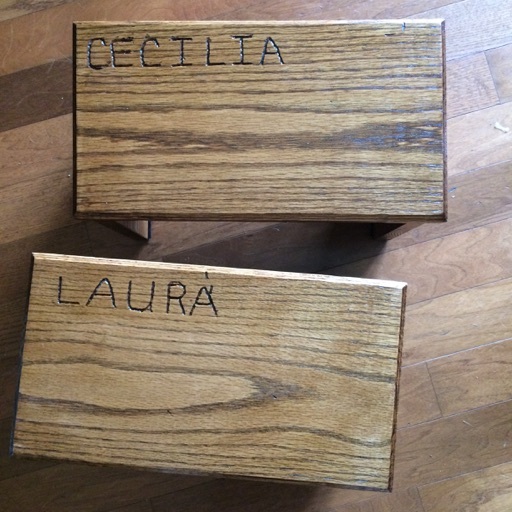 My mom and dad stopped by in late June on their way to visit family in Virginia and my dad brought the girls these stools that he had made and etched their names in. Our boys have similar stools with their names that they were given several years ago but the girls didn’t. These are so nice and special. Both girls have already enjoyed using them. Weston is such a big helper to his daddy and me. 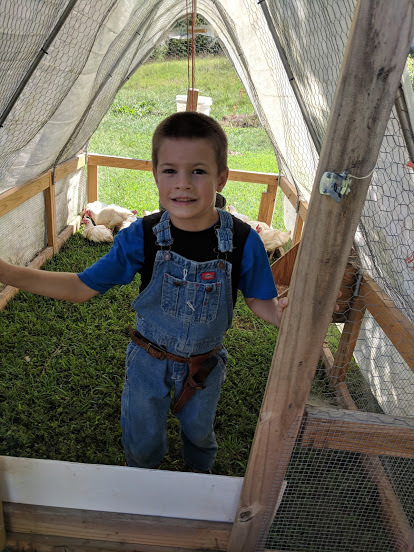 He’s my right hand man when it comes to managing our poultry and he enjoys helping his daddy move the electro netting for the sheep. Can you see where the sheep have grazed? It’s so neat to see how quickly they can eat down a portion of pasture. 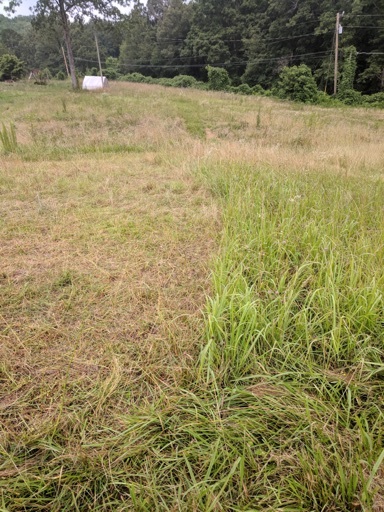 We’ve been giving them small fresh paddocks so they can ‘mob graze’ – I call them a ‘mini mob’. Surprisingly they enjoy browse a lot more than I thought they would. I had been talking about getting a goat or two to help keep posion ivy in check but the sheep eat poison ivy too! 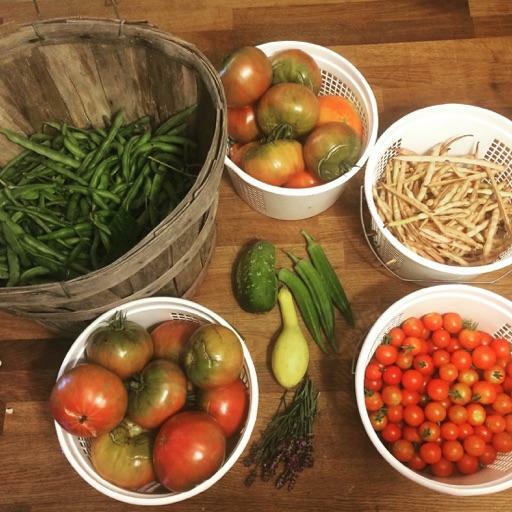 June was a fun month and we’re looking forward to harvesting lots of vegetables – especially our tomatoes – in July! 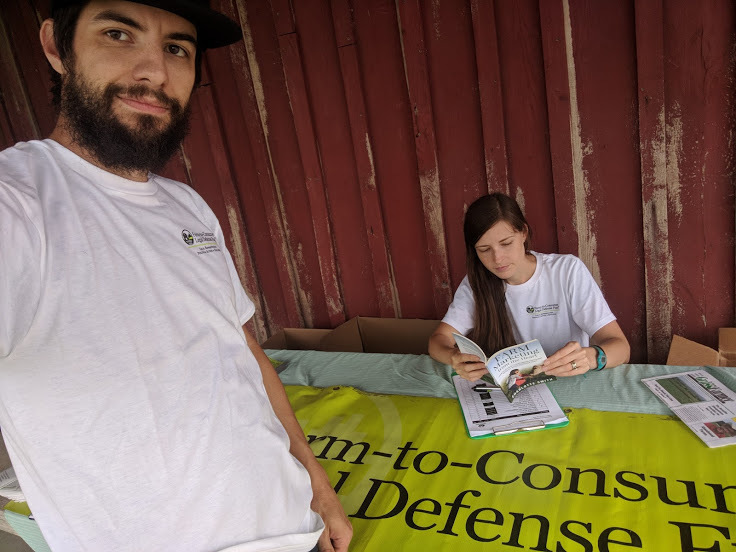 On June 9, we made the trip to Swoope, Virginia to visit Polyface Farm. 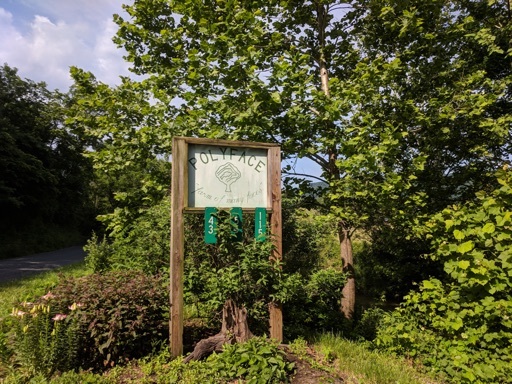 We were ‘introduced’ to Joel Salatin and Polyface several years ago and since then have read several of Joel’s books and watched several videos and documentaries about what the Salatin’s are doing at Polyface. We have been wanting to go for a few years now and finally just bought tickets for a Lunatic Tour and decided to make it happen. We brought both boys and John David’s dad on the tour. 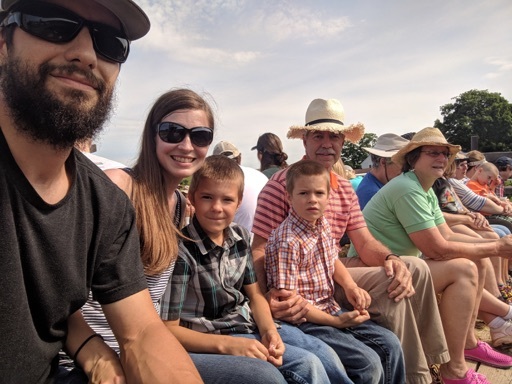 John David’s dad has a small beef cattle operation and we wanted him to join us! 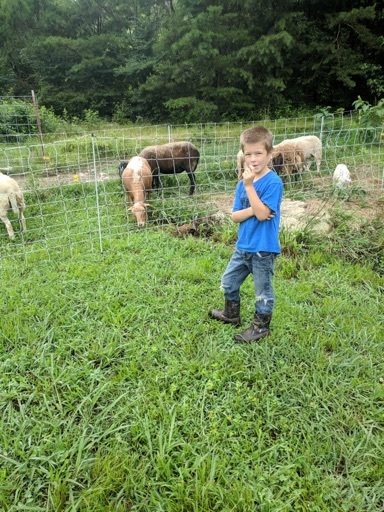 We had an idea of what the farm was like and were familiar with the way they managed their animals but we just wanted to see it for ourselves. Here’s the barn where they feed cattle for the winter. 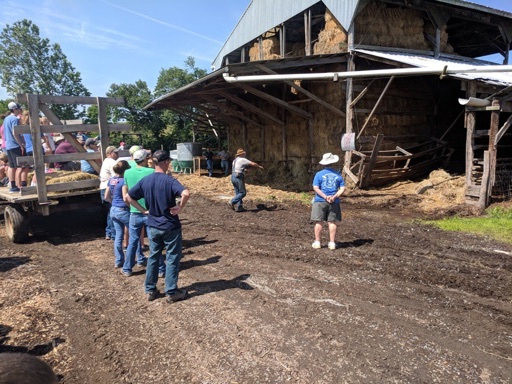 Joel is describing the way they feed their beef cattle and the value of the manure to the fertility of the farm. I was most excited about seeing the egg mobile first hand. 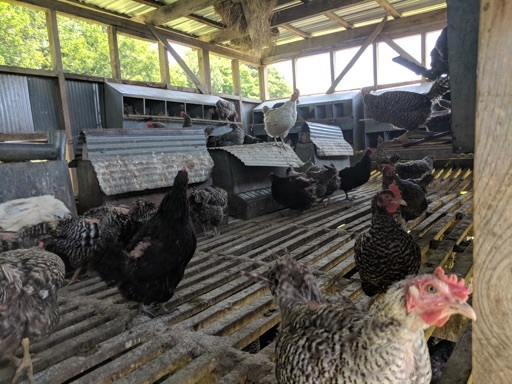 Here’s a glimpse inside the Polyface Egg Mobile and several of Polyface’s happy and healthy hens. 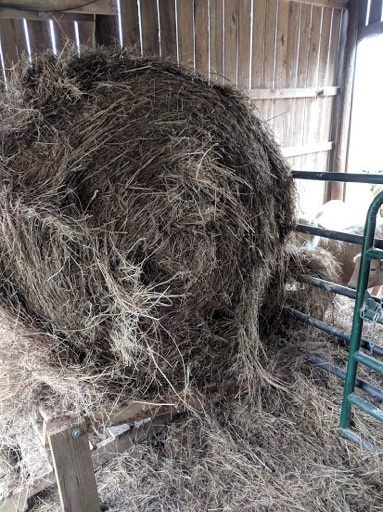 One of the things we love about the Salatin’s operation is that they are thrifty. They don’t have the newest, shiniest, latest and greatest things for their farm. They are very practical and frugal because it helps make a farm profitable. Some of the Salad Bar Beef at Polyface. Paxton purchased a Polyface Coloring Book with his own money and was excited to have Joel sign it for him! The boys with Joel. Weston was more excited than his expression would lead you to believe. We were excited to be able to meet Joel. 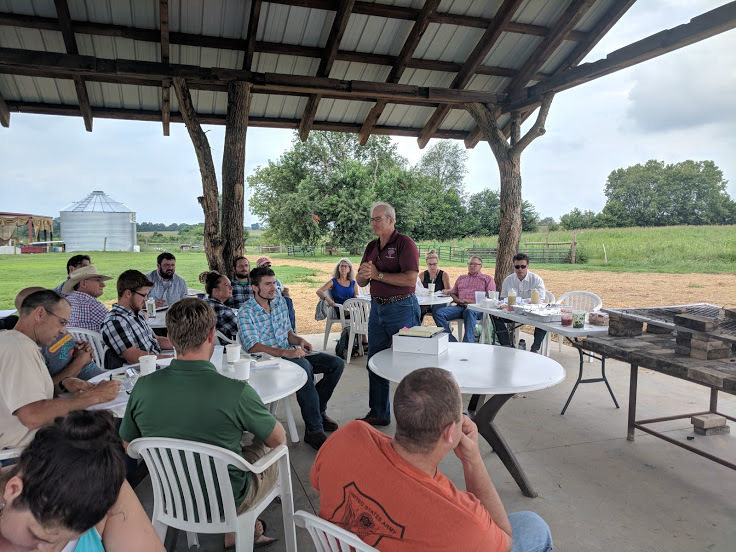 He is an amazing communicator and educator, an inspiration to so many and is so kind to the people who visit his farm. The boys are already talking about taking another trip to Polyface one day so Cecilia and Laura can see the operation first hand. I love that they want their sisters to visit Polyface too. We left the visit inspired. 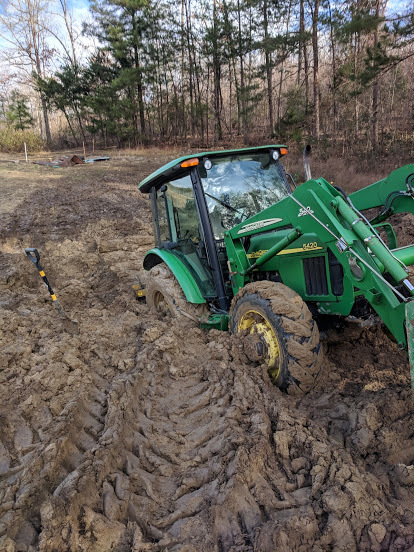 While our little homestead cannot be compared to an operation like Polyface, we realize that there is so much potential on our 5 acres. We just have to dream, plan and do the work! 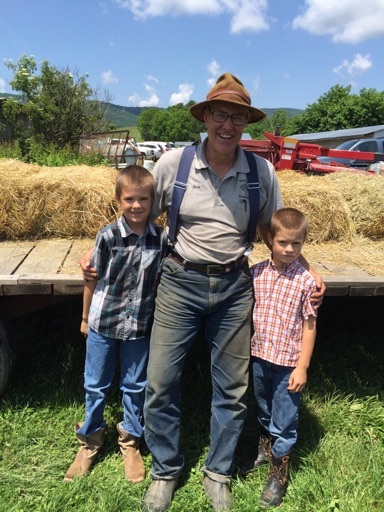 We’re so thankful for pioneers in sustainable agriculture like Joel Salatin.